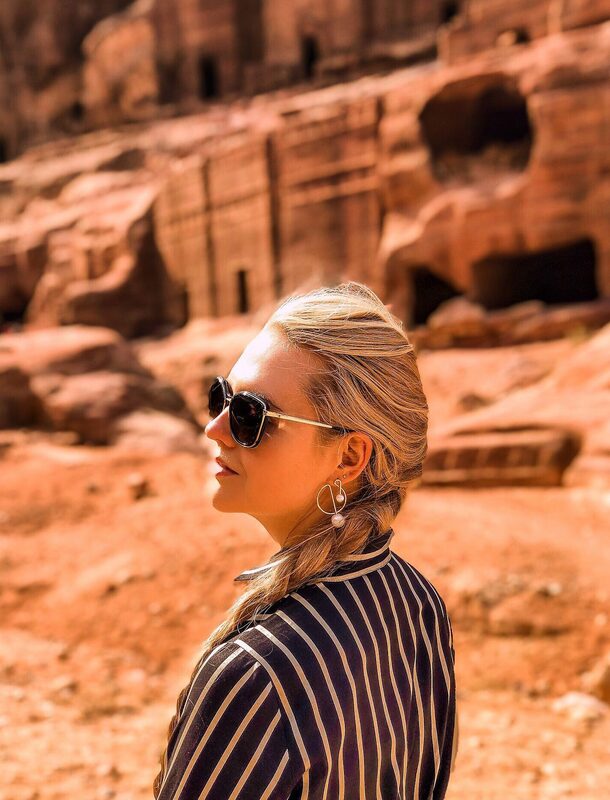 In today’s blog I’m going to share with you our trip to Petra, an ancient city which is considered to be one of the New Miracles of the World. 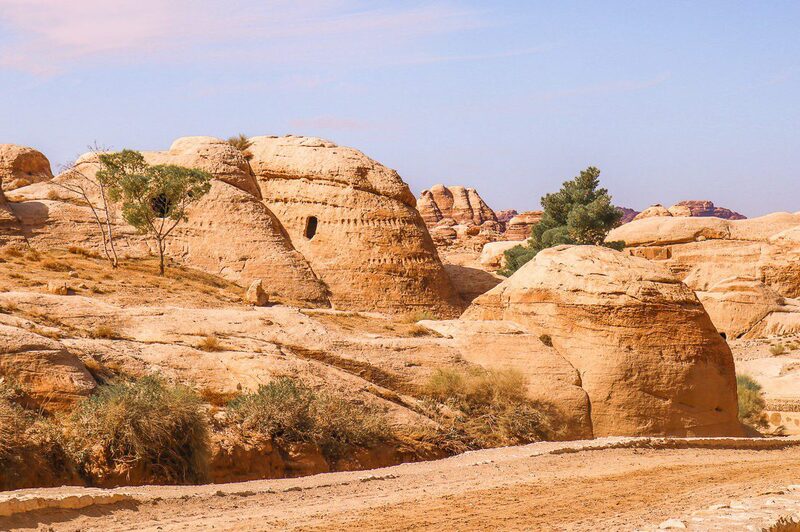 Some archaeological evidence suggests that this place was inhabited about 12 thousand (!) years ago. 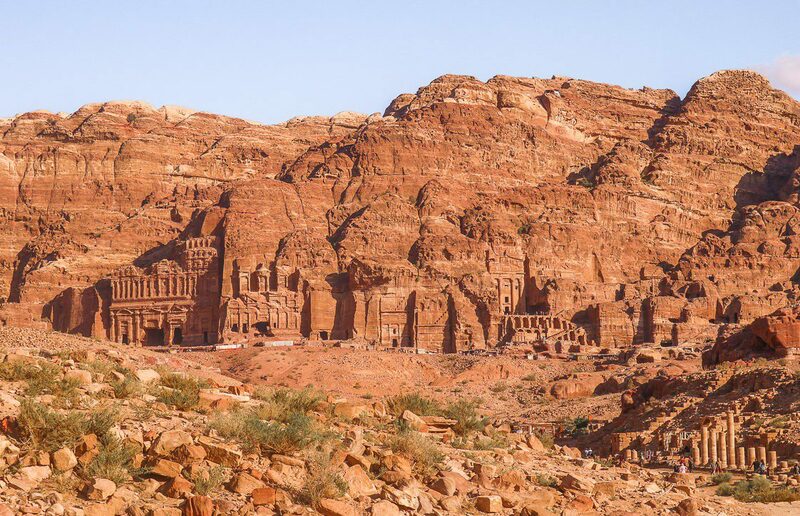 In the first century BC it’s already been a prosperous capital of Nabataeans who turned it into the oasis in the heart of the desert. 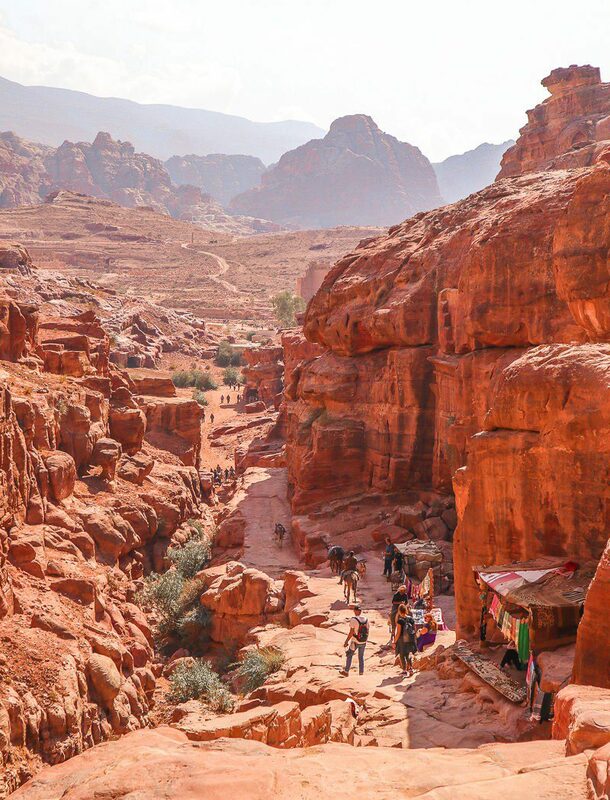 It raised to a full glory when Petra became an important trade city – and later was taken over by Romans in 106 AD. 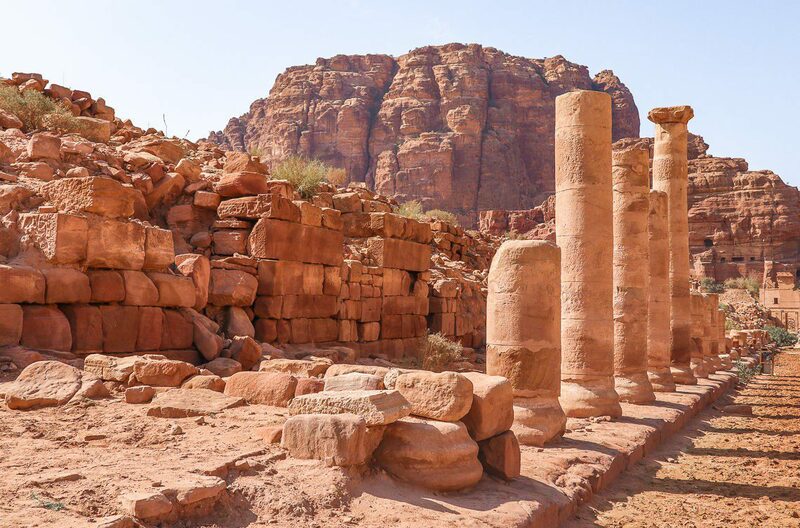 Years passed, Nabateans vanished, commerce tended to become a sea-based one, and several earthquakes (the main one happened in 363 AD) struck the city – and Petra was abandoned andfell into a state of disrepair. 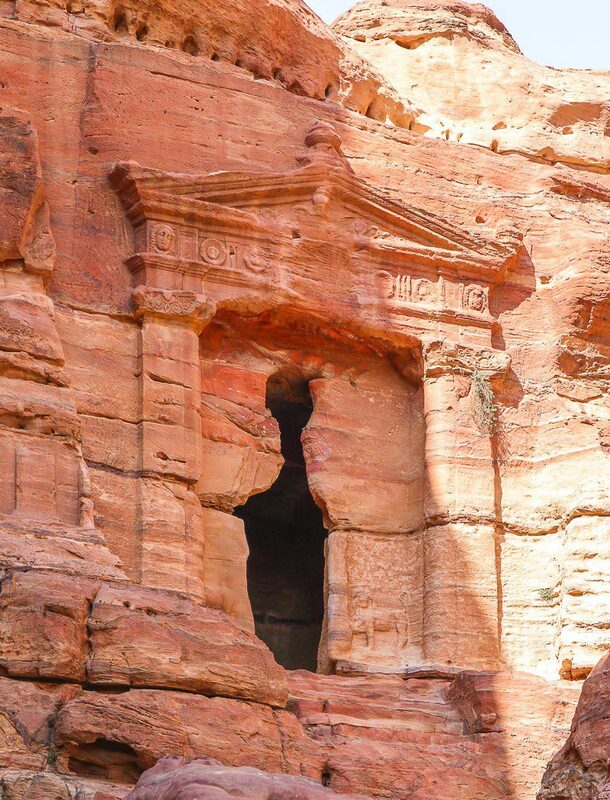 For many centuries it was a real Sleeping Beauty left preserved by natural forces. But finally it was in some sense ‘rediscovered’ quite recently (compared to the age of the city! 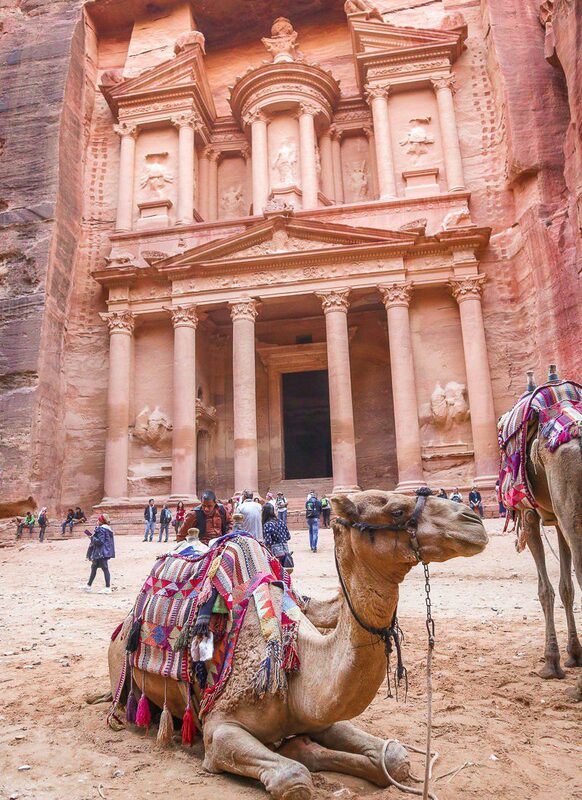 ), only in 19th century – can you imagine the stupor of the explorers who out of blue faced such magnificent constructions carved out of the rocks? 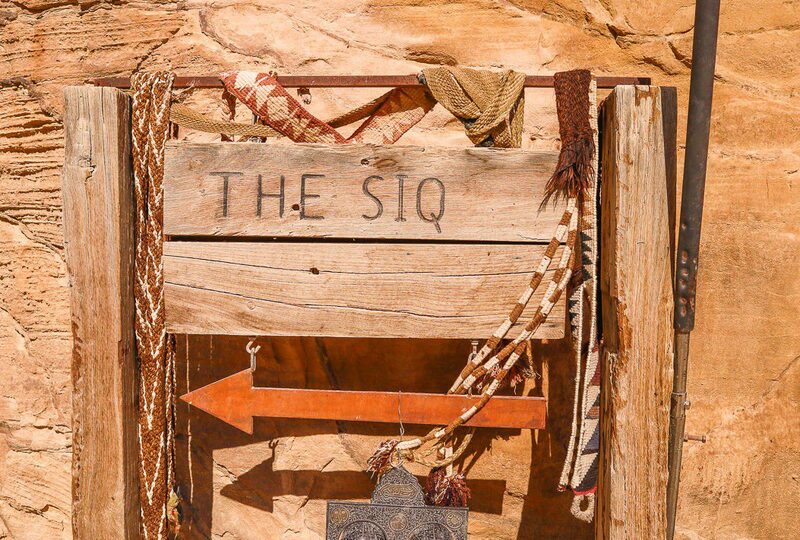 No surprises it’s frequently called ‘The lost City’. 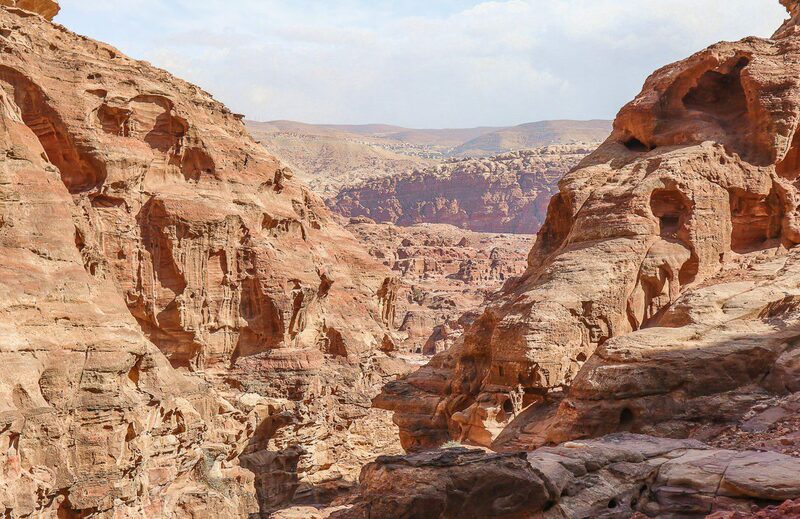 In 1985 it was enlisted as a World Heritage Site by UNESCO. 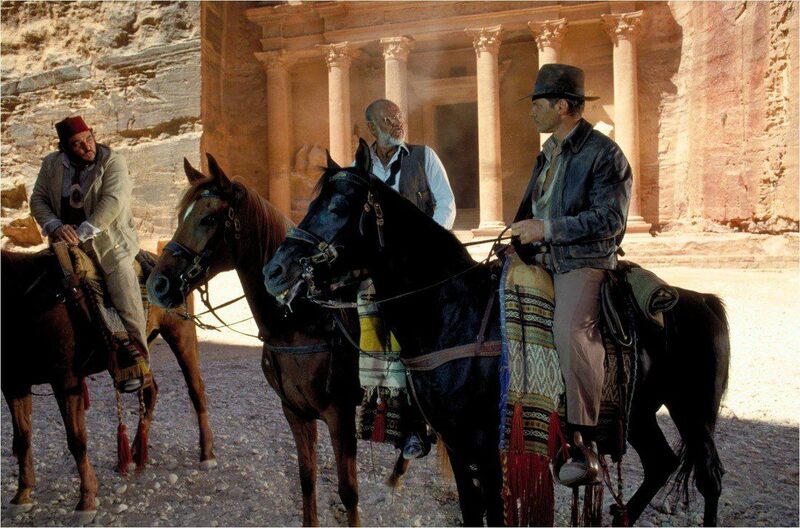 The general public was first introduced to it when it was following the steps of Indiana Jones Jr aka Harrison Ford and Henry Jones Sr aka Sean Connery who found there the Holy Grail. 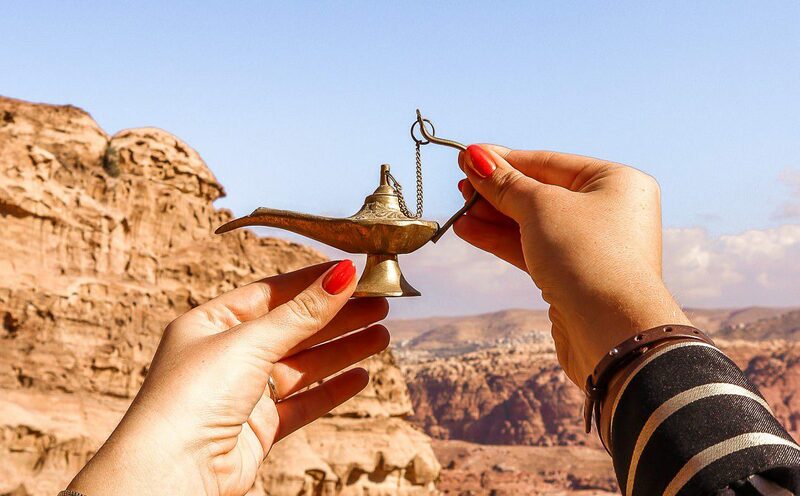 Soon it became an extremely popular tourist attraction – it was even voted as one of the New Seven Wonders of the World! 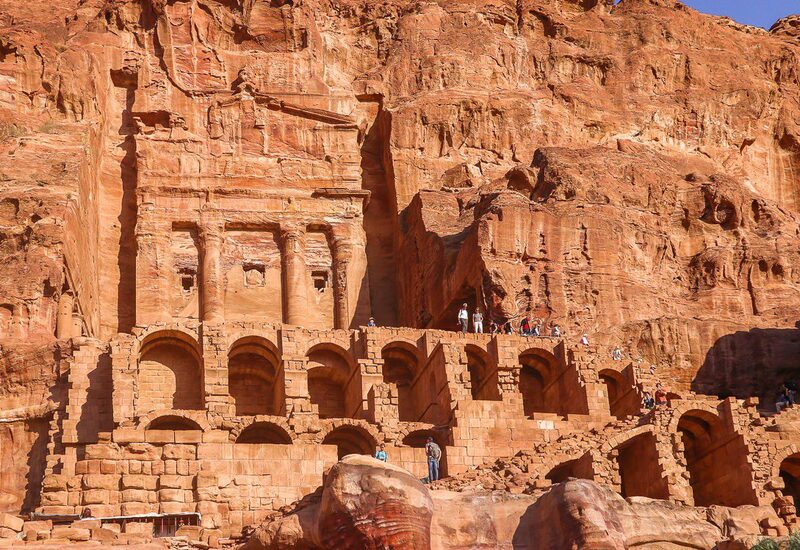 There are many concerns about the preservation of its ancient constructions but as long as I know the country started taking the conservation works more seriously. 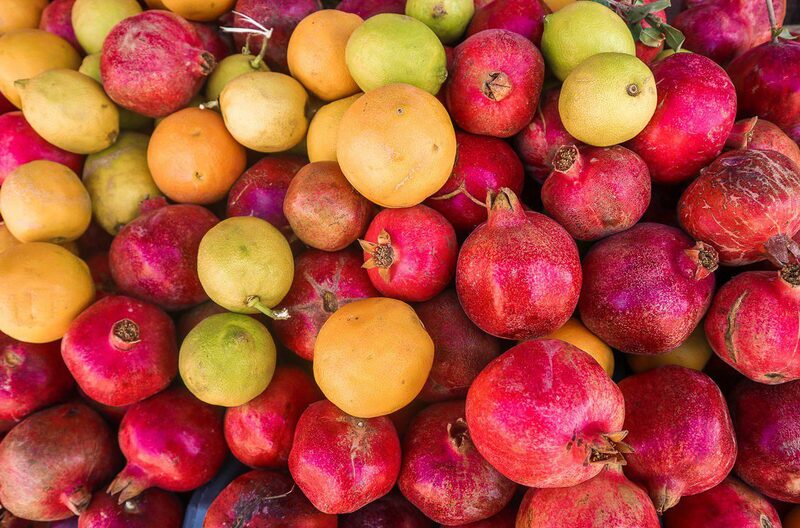 What to know before the visit? 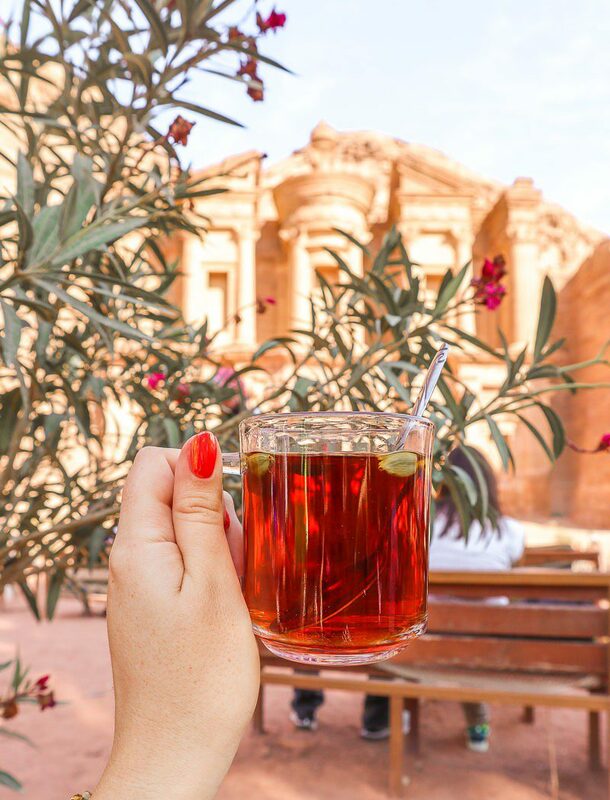 Petra is much more than just a treasury where everyone takes photos. 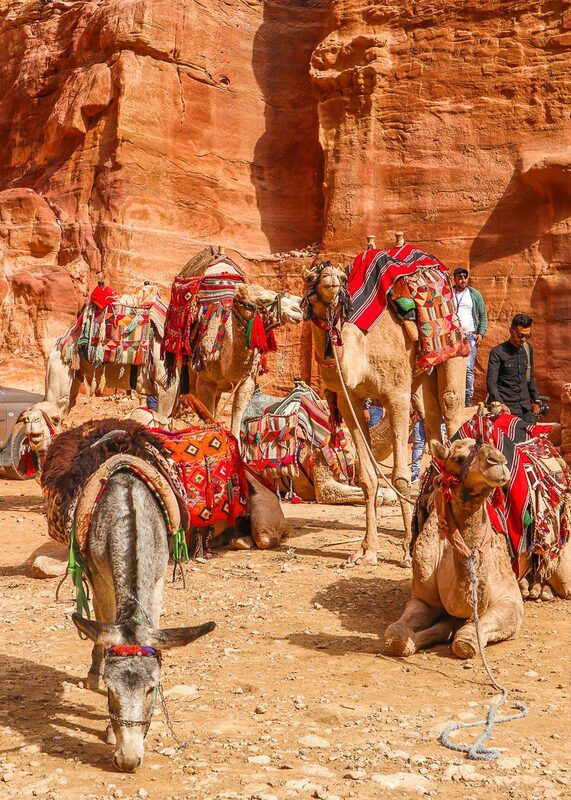 It’s a huge territory with numerous archeological sites stretching for many square kilometers. 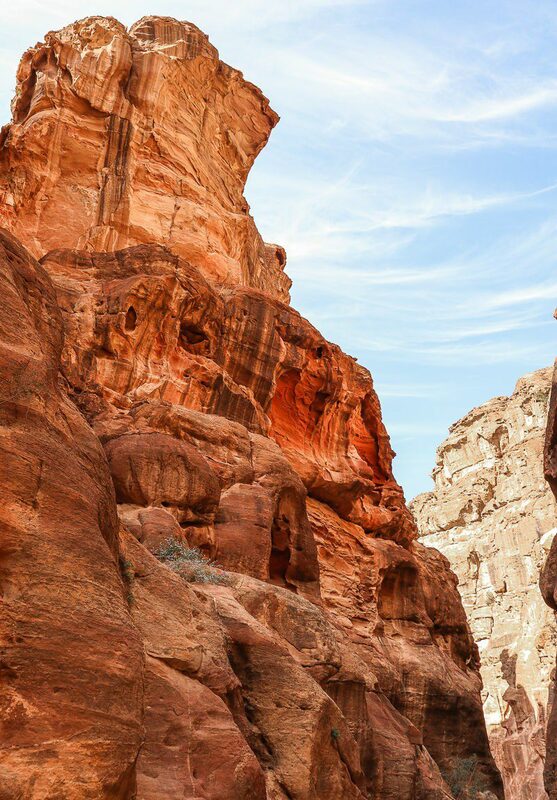 If you don’t have enough interest/time/physical strength you can just see the main sites in a relaxed walk around because many hiking trails are really challenging. 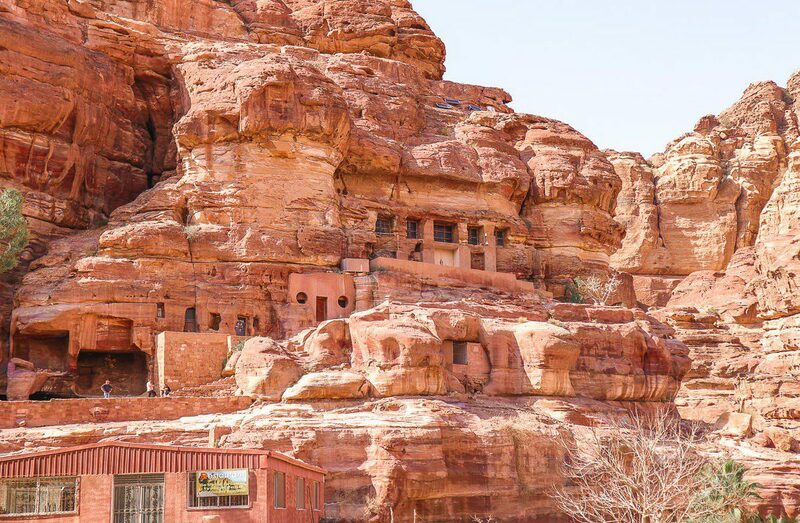 The full itinerary includes all archeological locations not only the from the Siq, the beginning of the route, to the Monastery, but also less visible hiking paths which only an experience guide can indicate. 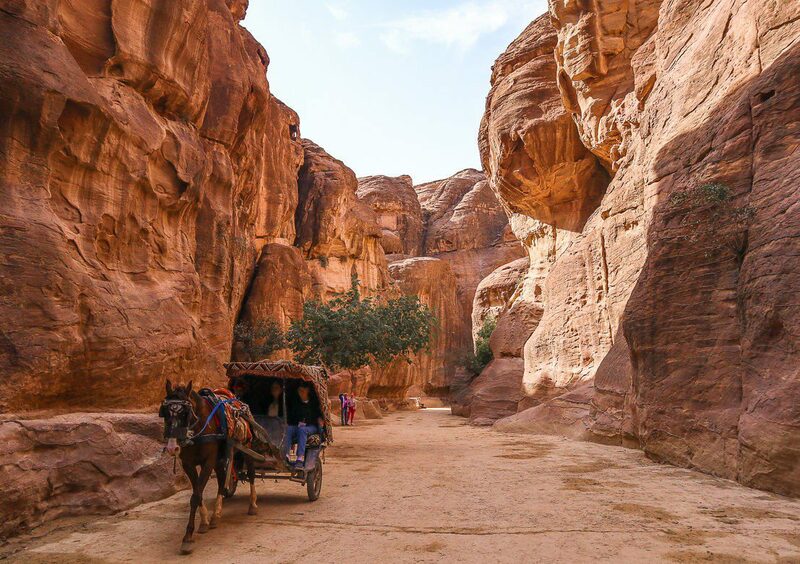 And don’t forget that you have to return back to the entrance from the Monastery and other trails – so if it is to be explored to the fullest, it’s quite exhausting but an absolutely rewarding journey! 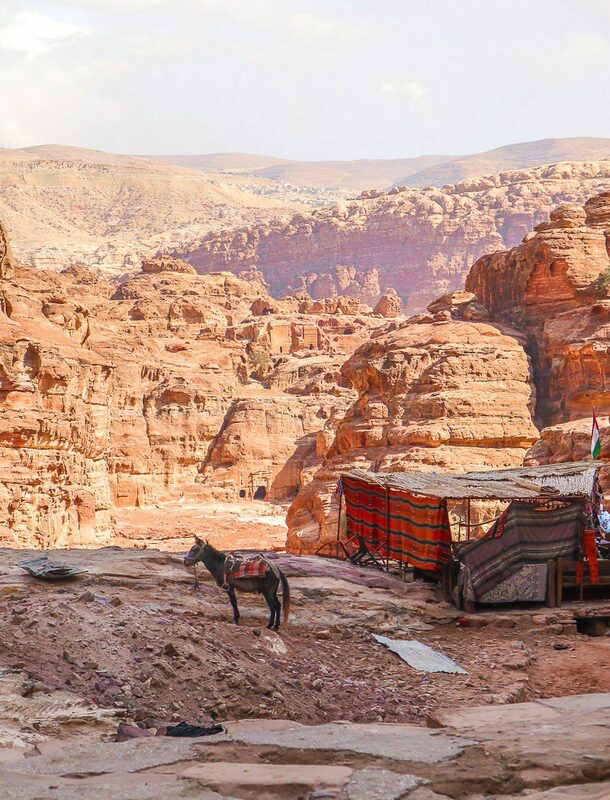 Interesting: Petra is actually located in the area where Bedouins lived – to allow the touristic access, the government negotiated with them to make them move their houses from the area. 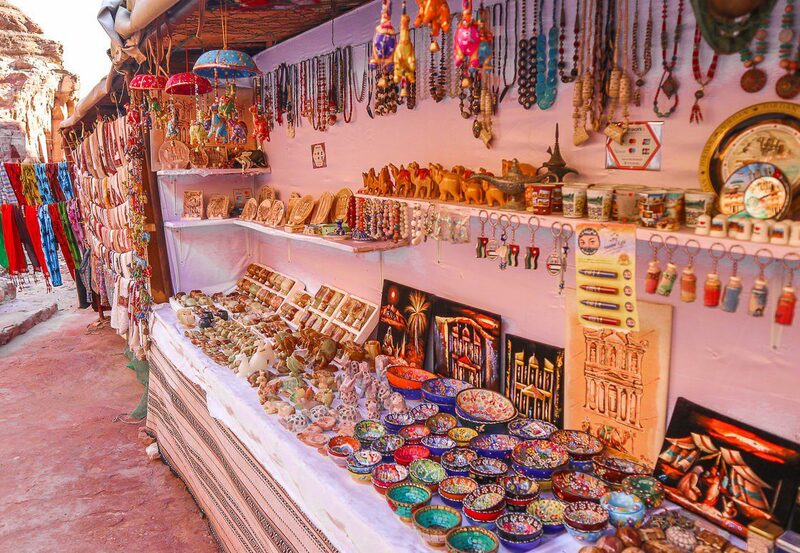 You can still encounter many bedouins selling their local products to tourists. 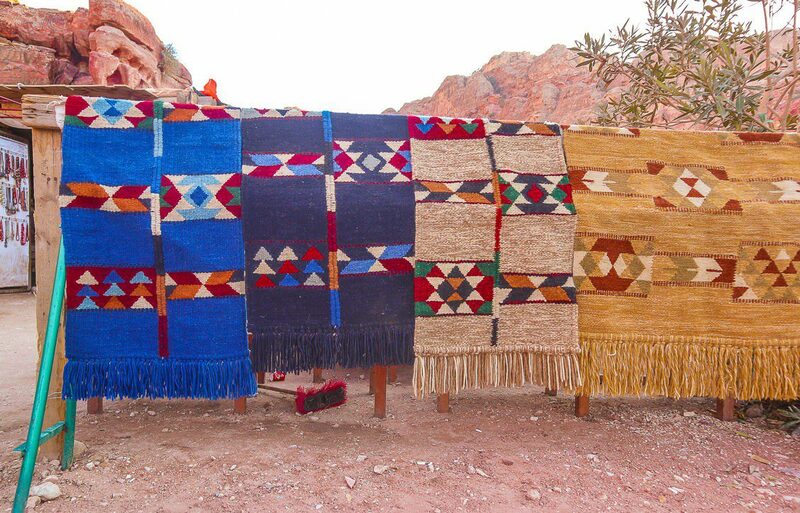 Tip: although Jordan is generally considered to be a safe country, I’ve been advised by my Jordan friends to pack my trip wardrobe thoughtfully. 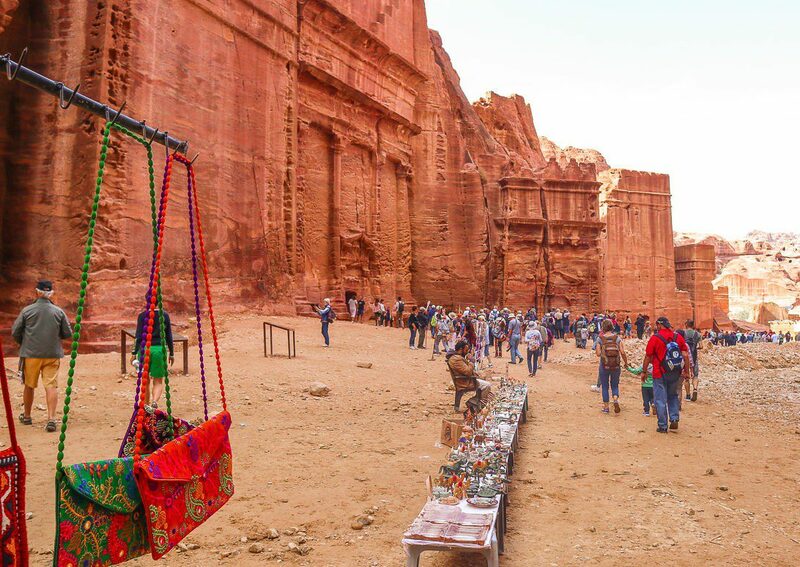 In the capital the cloth approach is more relaxed and Petra is obviously one of the main touristic spots, but I opted for the all-covered dresses anyway just to respect the traditions and to feel less gazed. 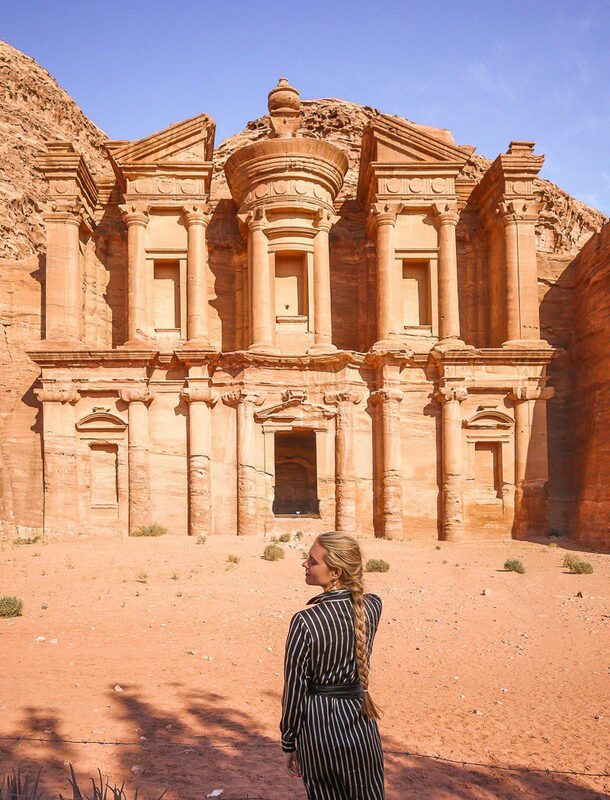 Unfortunately, we had only one day for Petra. And we had to hurry up a bit but not to the full exhaustion. 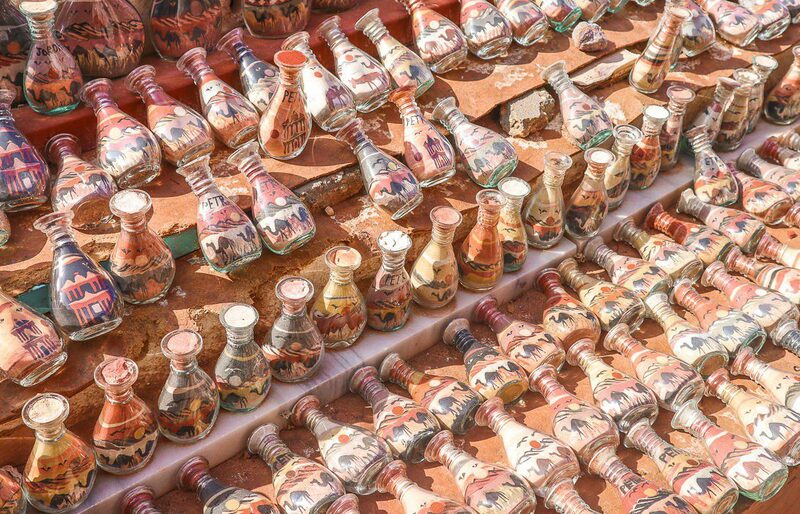 As a result, in this blog you’ll see what is doable in one day – and I included bits of extra information as well. Interesting: If you think that you’ve seen the views that are present on my photos you’re probably not mistaken: it has been featured multiply times in movies, for instance in Transformers: Revenge of the Fallen, The Mummy returns, Arabian Nights, Mortal Kombat: Annihilation, mentioned above Indiana Jones and the Last Crusade and many others. 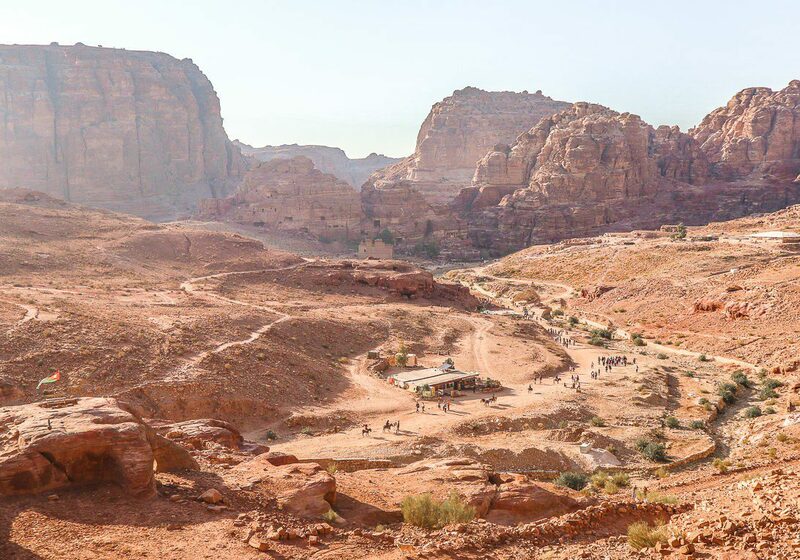 Actually, other locations in Jordan such as the Valley of the Moon, Wadi Rum, might look familiar as well because they are frequently used as the scenes for the Mars shootings. 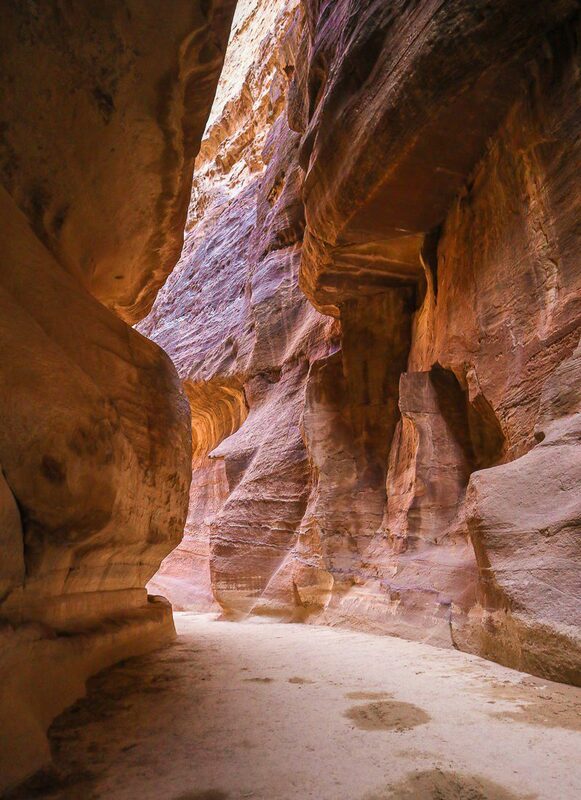 The Siq is most dramatic prelude to the ancient city of Petra that can only be imagined. 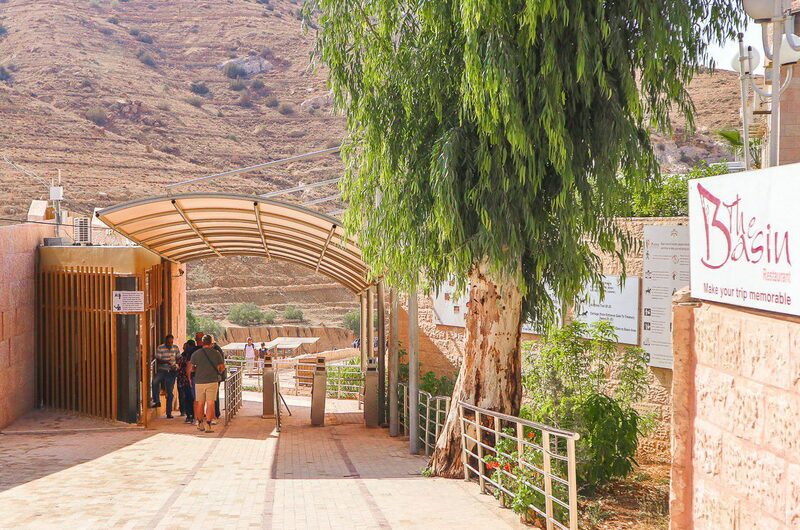 It’s a 1,2km long corridor that takes you straight to the Treasury. 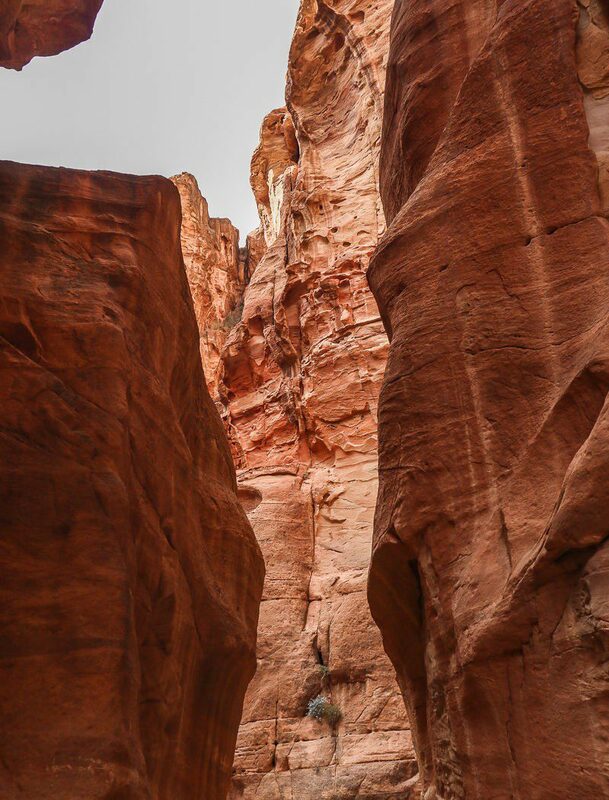 Tectonic forces created a real wonder with the 200m stone walls coming all the way up, touching the sky and showing all the magnificent colours they contain. 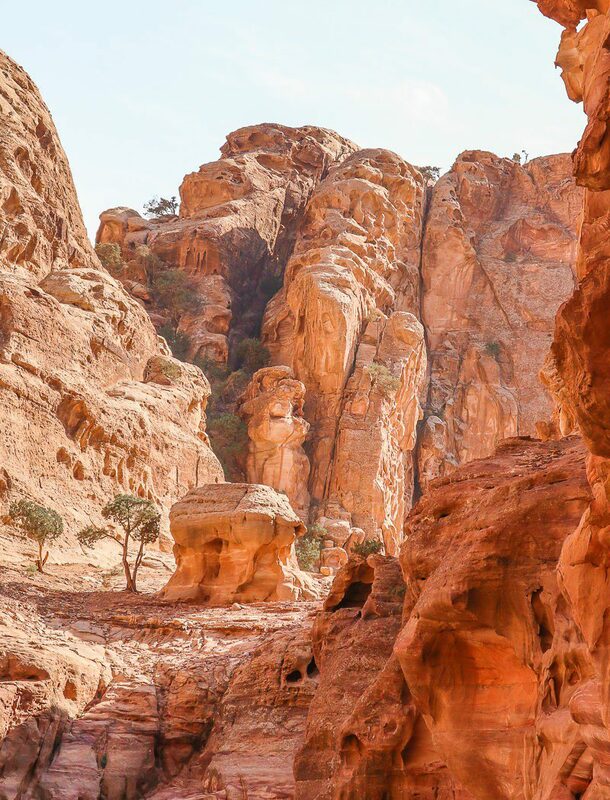 If you keep your attention high enough, you can spot the niches and carvings in the walls that possibly were used by the Nabataeans during some kind of the sacred processions though the gorge. 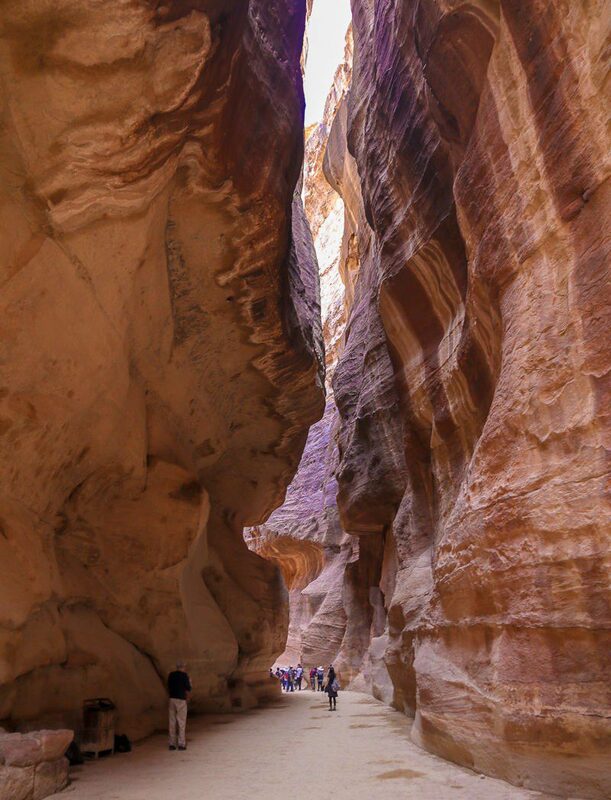 The Treasury, or Al Khazneh, is the most well known spot of Petra – but don’t get relaxed, it’s just the beginning of the main route! 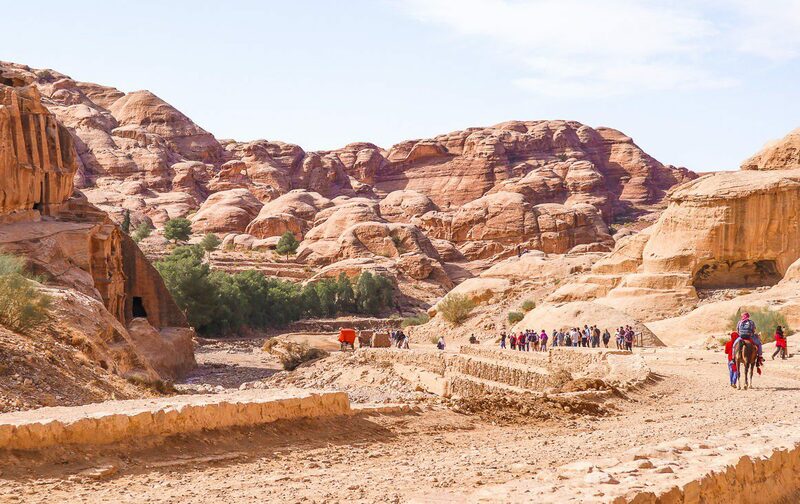 Actually being a tomb of the Nabataean King Aretas III, this building carved out of the sandstone is really breathtaking – but flooded with tourists, locals, police and animals. 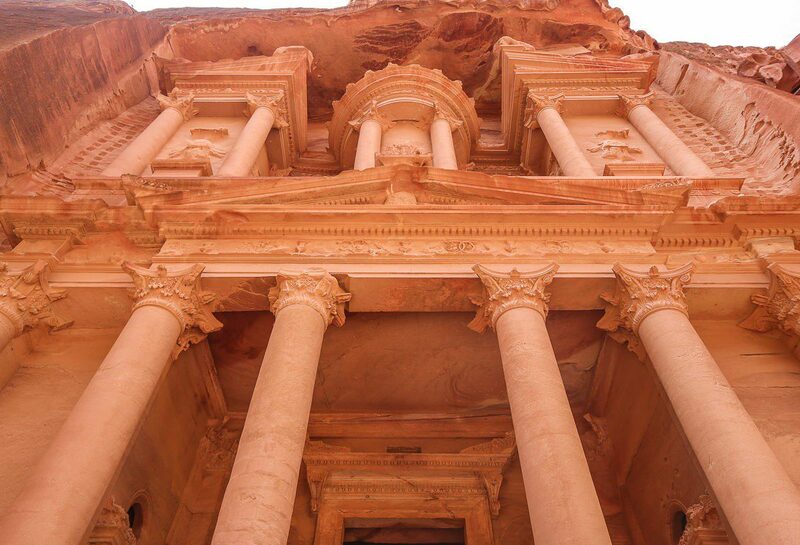 If you wonder what are the holes in its facade – there are the bullets holes. 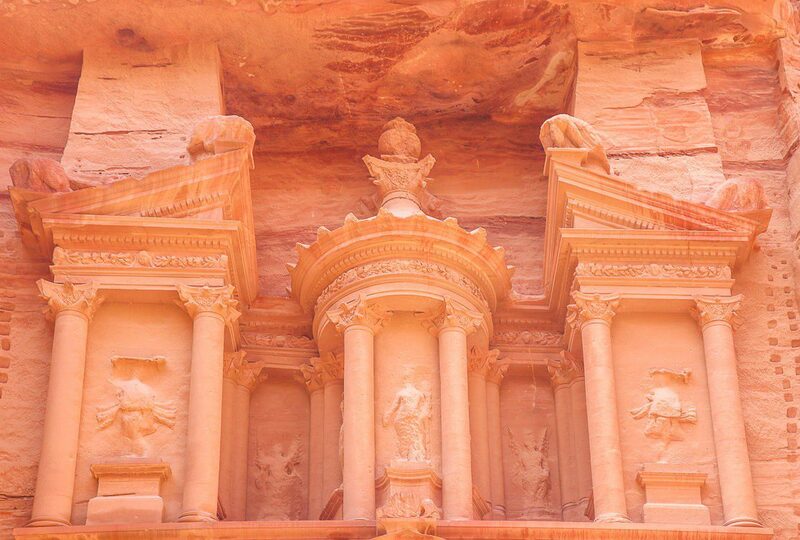 It was believed that the urn on the top of the Treasury contained gold, and local tribes were trying to reveal it by firing their guns into the rocks. Interesting: actually in Russian we have a word казна– kazna – with the same meaning which clearly originates from the Middle East. 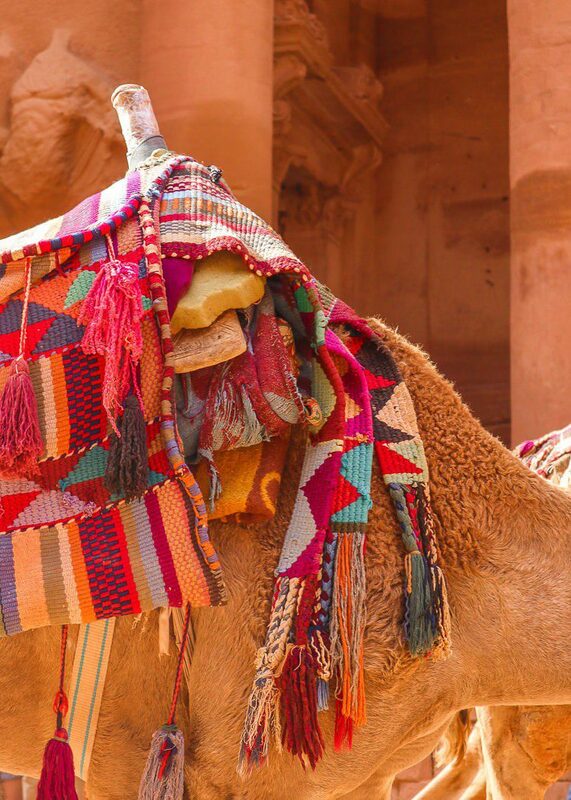 One of the issues that worried me before my travel was the animal mistreat. 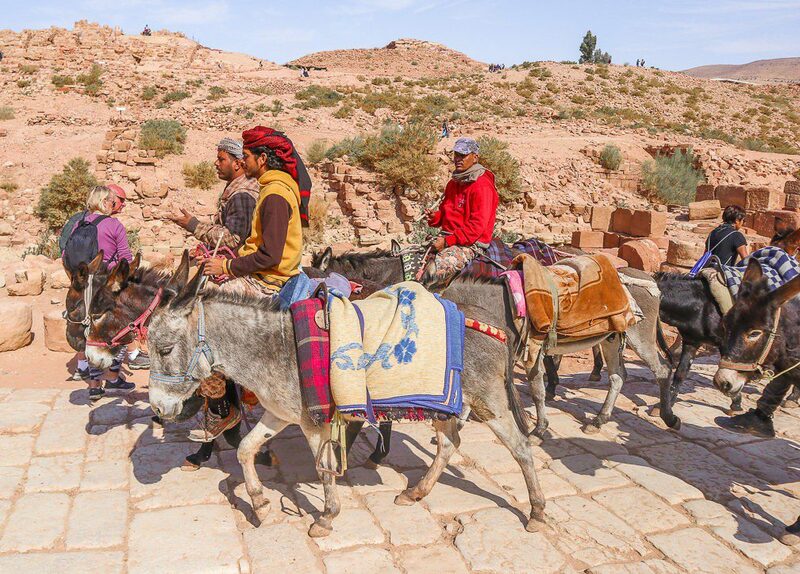 In Petra there are a lot of donkeys, camels, mules and horses that transport tourists. 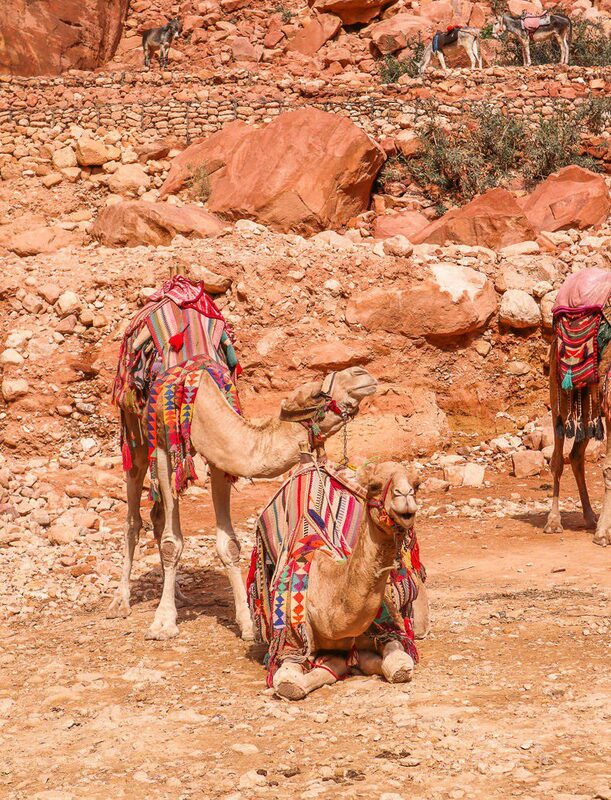 If camels are considered more ‘valuable’ and treated better, donkeys were said to be really abused. 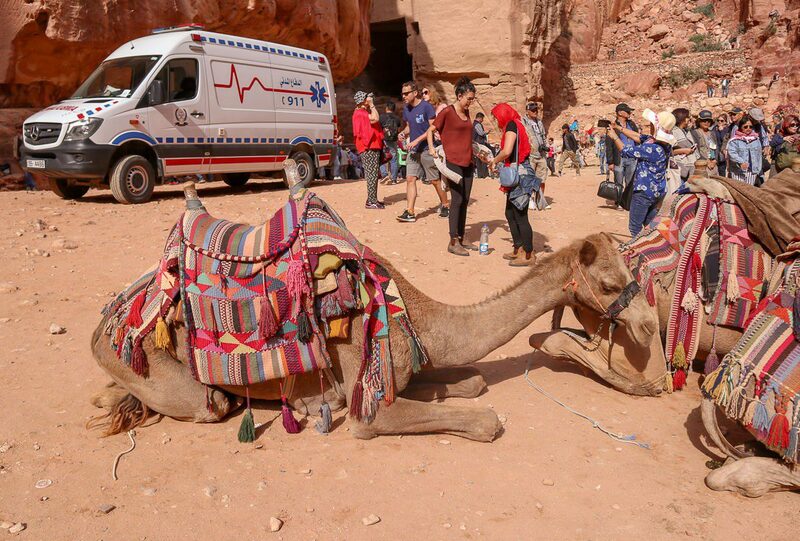 Even the international animal defence organisations were raising this issue – and this year the Vet clinic has been opened. Have I noticed anything myself? 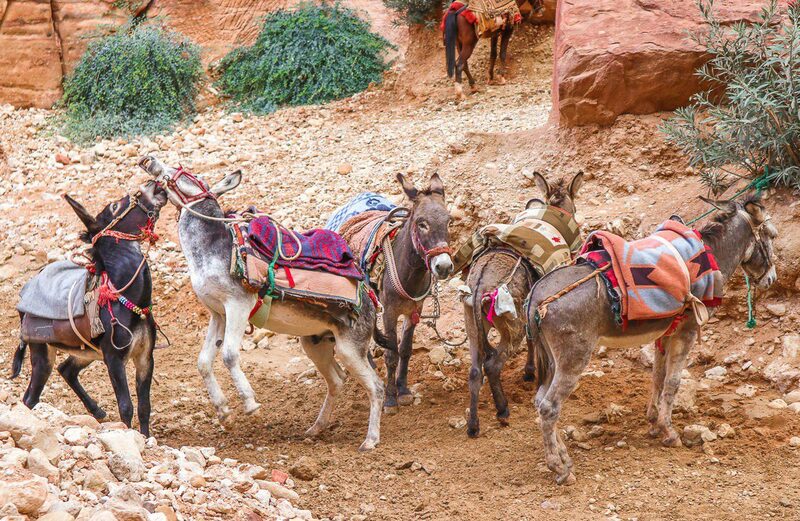 Well, some tourists definitely were too heavy for small donkeys but I cannot say that I’ve witnessed any real abuse with my own eyes. Anyway, there are signs with contact details where a visitor can report a case of animal mistreat. 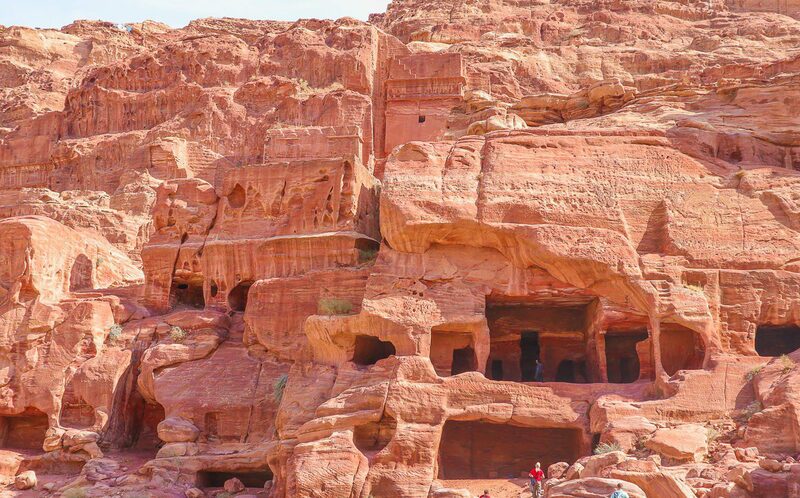 Continue on the main trail – and you’ll pass impressive houses and tombs carved out in the rocks. 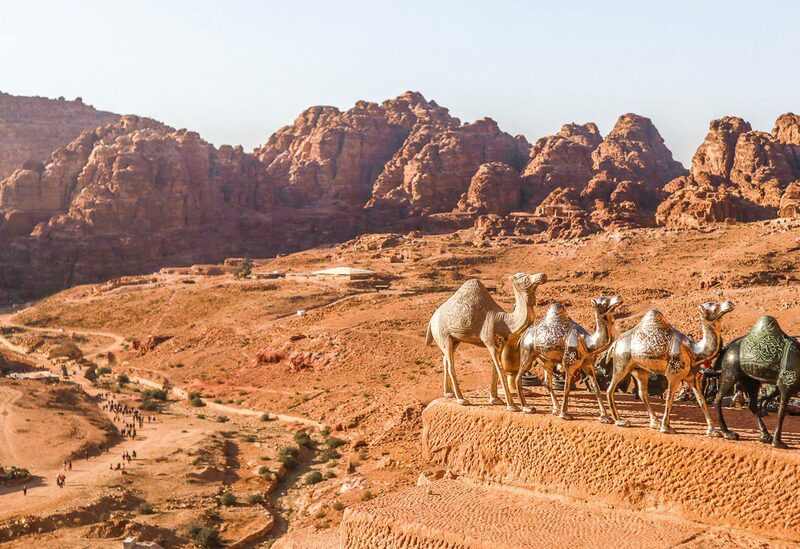 There are over 40 of them, all of different shapes and sizes, built by the Nabataeans. Just passing through the Street of Facades you’ll bump straight into the Theatre. 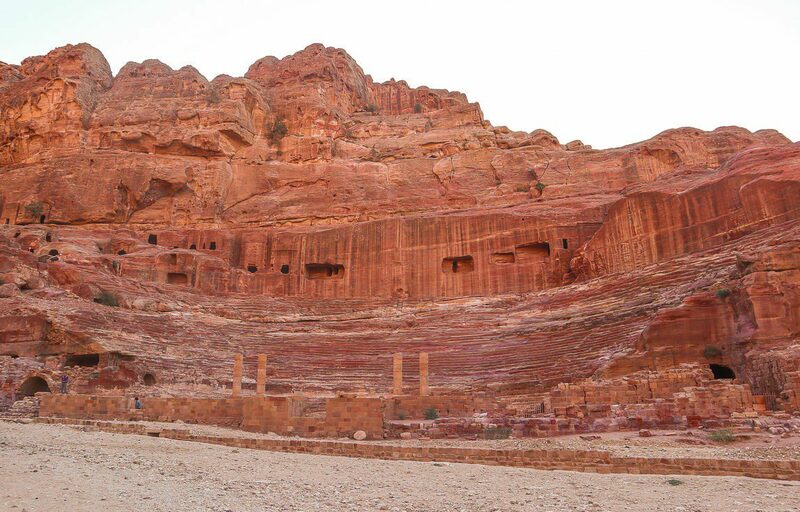 It’s really huge and it’s the only one theatre in the world carved in the rocks! 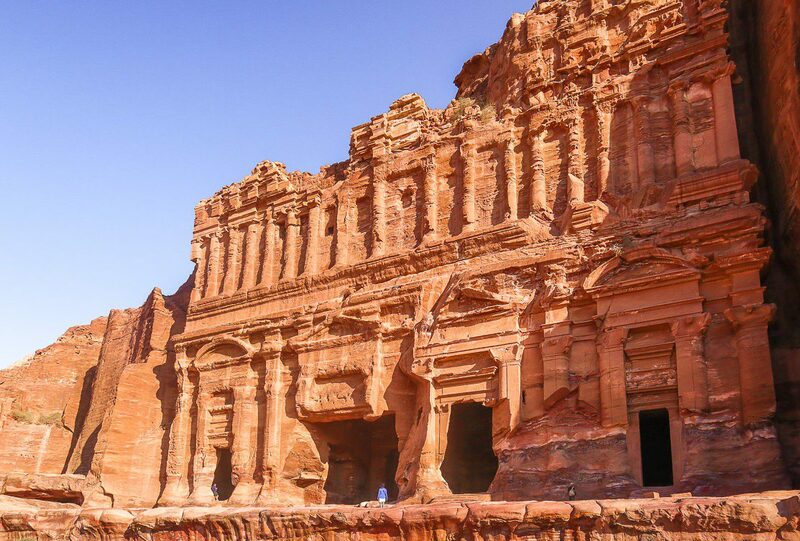 Originally constructed by the Nabataeans, it was later modified by the Romans whose love to the theatres is pretty well known. Unfortunately, I couldn’t find the exact capacity of the theatre – it seems that originally it contained about 3000 seats and later was enlarged to fit 8500 individuals. 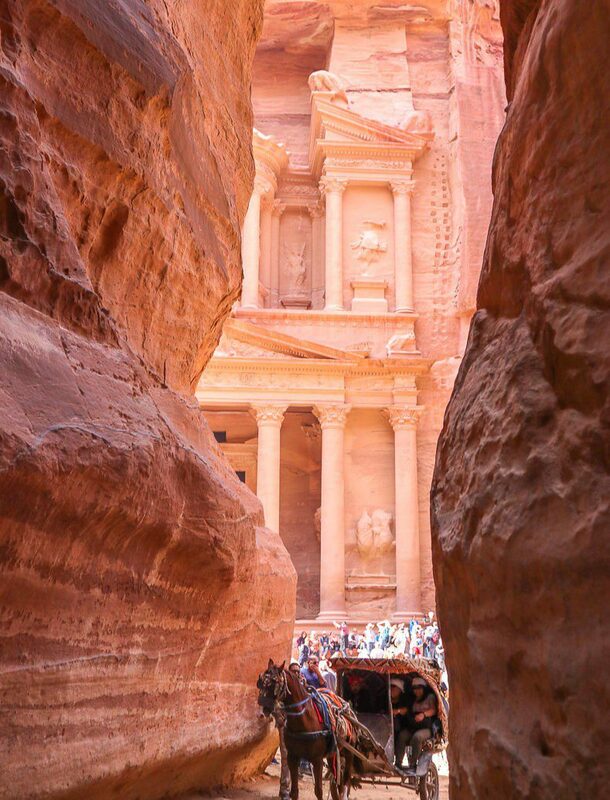 There is a little appendix starting almost immediately after the Theatre that leads to the Royal Tombs. 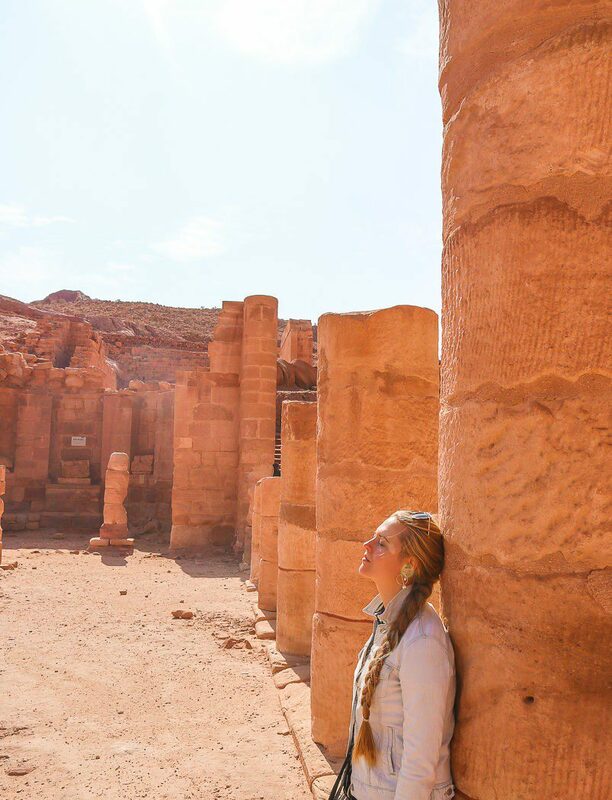 Judging the remnants of the Royal Nabataean tombs, once they were a set of really magnificent buildings but unfortunately the time didn’t have any mercy to them as well as didn’t people who were modifying it over the years. 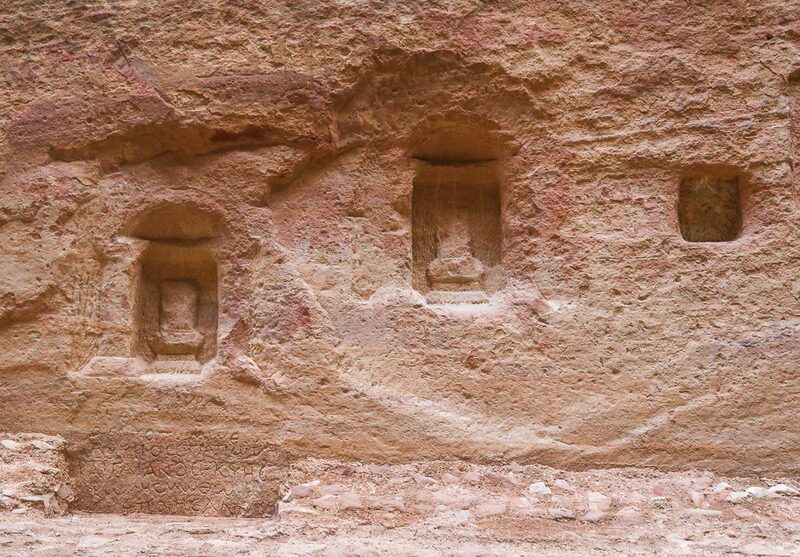 There are four main tombs in total. 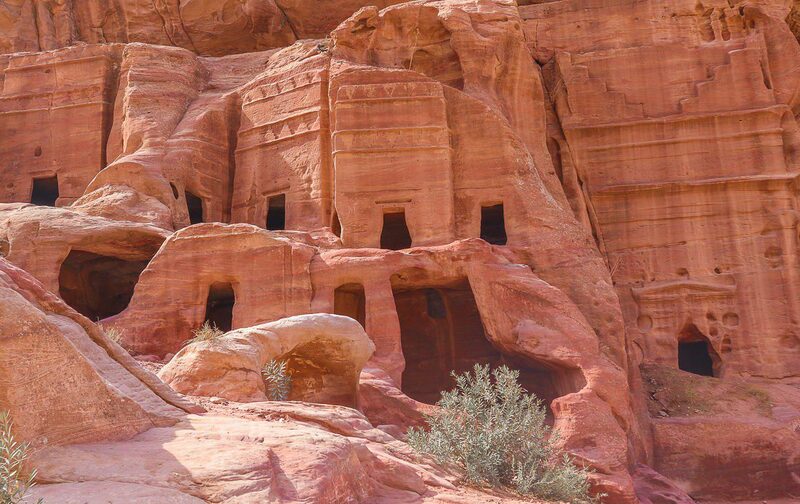 Urn Tomb, the largest of them all that dates back to 70 AD and served the last habitat to the Nabatean ruler Malichus II – another version is that that’s the tom of Aretas IV. Its interior reflects the way it was converted to the church. 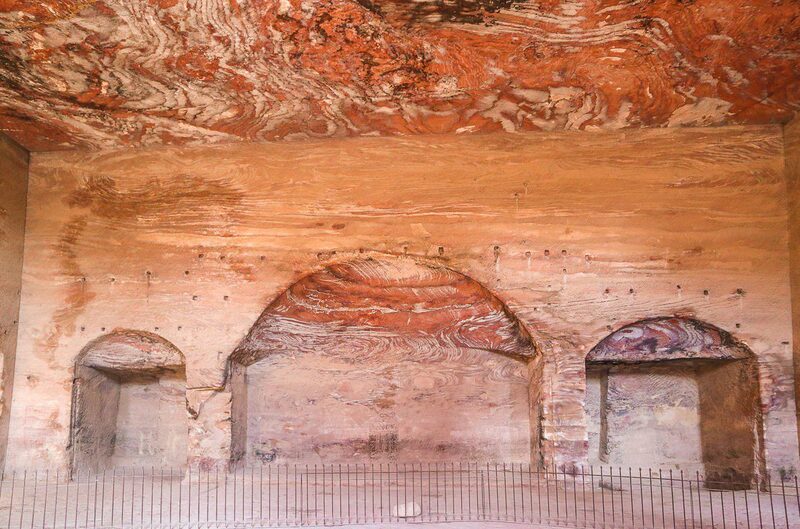 Next one is the Silk tomb – just look at the colour and the structure of this tomb, doesn’t it remind you of the precious tissues! 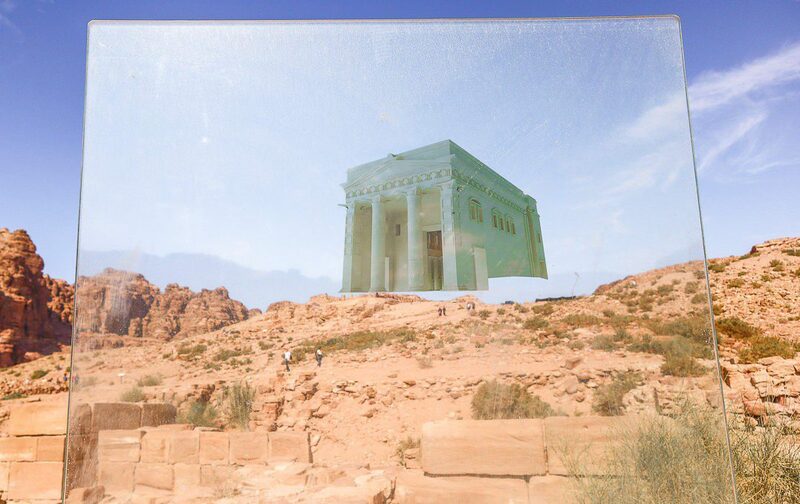 The Corinthian Tomb has the same structure as a Treasury but it’s not preserved to the same extend. 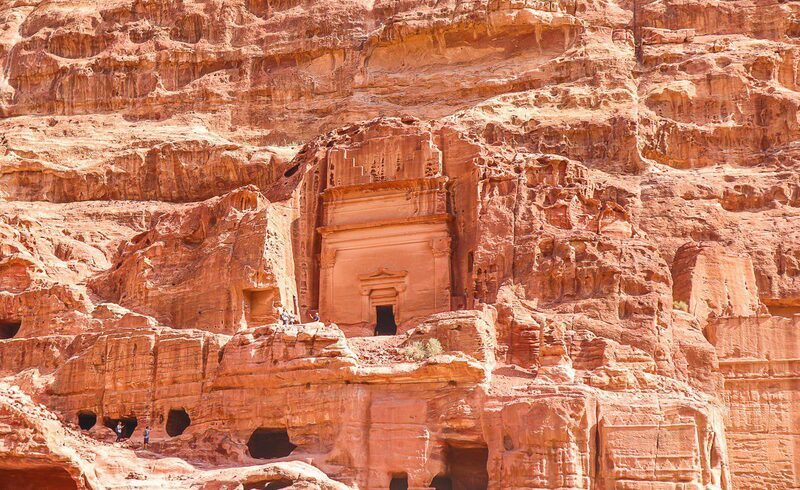 The last one is the Palace Tomb that resembles a real palace! Just look how high it is! 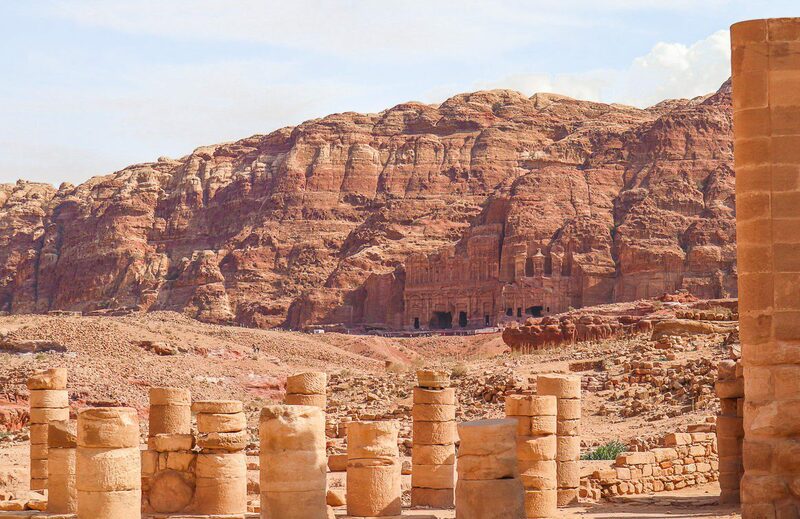 Among other notable tombs in Petra located at the different parts of the park there are: Obelisk Tomb where Greco-Roman and Egyptian architectural styles are mixed together, Sextius Florentinus (who was a Roman governor and who wanted to be buried in Petra)’ Tomb , Lion Tomb with two lions on its sides, tomb of Uneishu who was a Nabatean king. 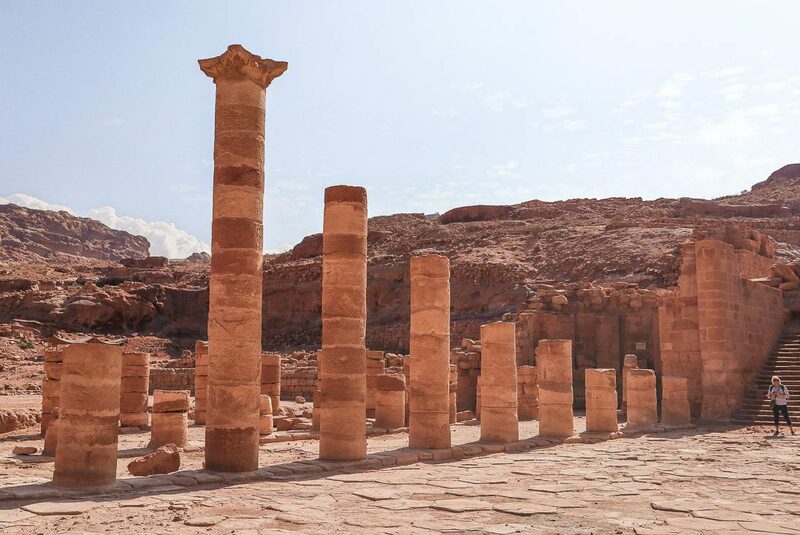 The Colonnaded Street is another reminder about Romans residing in Petra who modified the original Nabatean architecture. As the title suggests, this road still has some semi destroyed columns surrounding a surviving stone road – at its best time different building were erected. 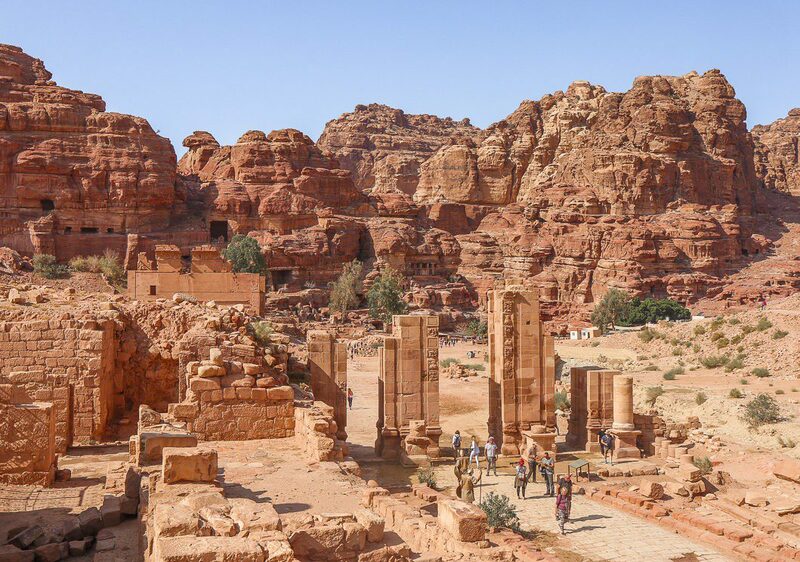 Just opposite to the theatre there are remnants of the Byzantine Church with amazing mosaics and Winged Lions Temple, monument to the al-Uzza, the Nabatean goddess – but you have to leave the main trail to pop in. 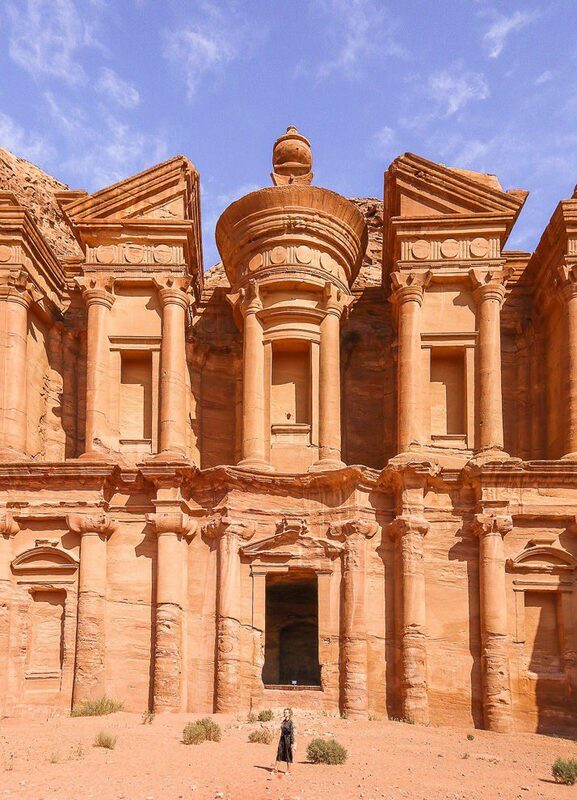 This magnificent freestanding construction is a rare thing in Petra as other buildings are carved in rocks. 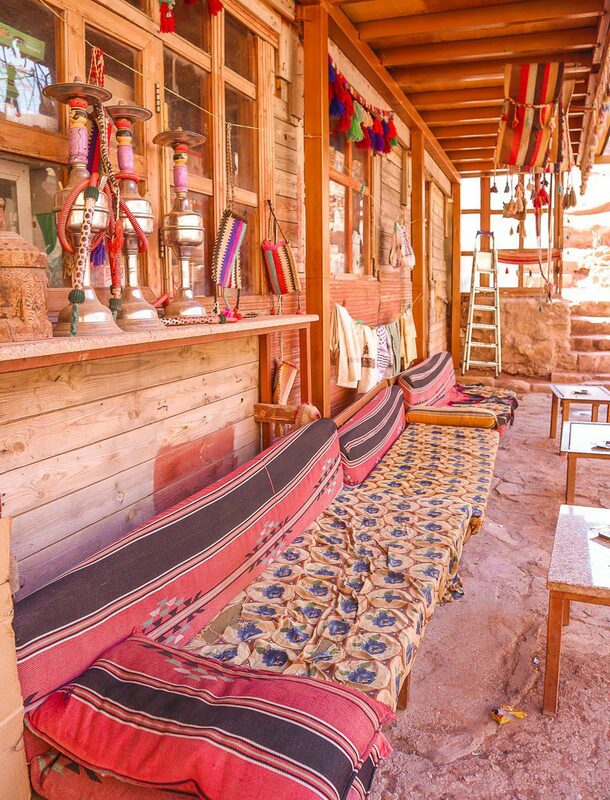 Besides that, its exterior was likely to be painted in red and white contrasting with the mountains all around. 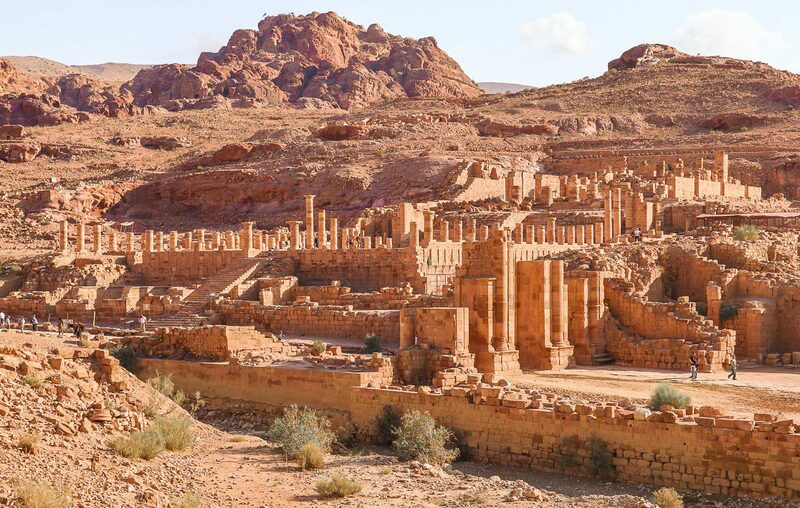 The Great Temple was reconstructed by the experts from the Brown University and now presents a marvellous example of what can be done with the ruins. 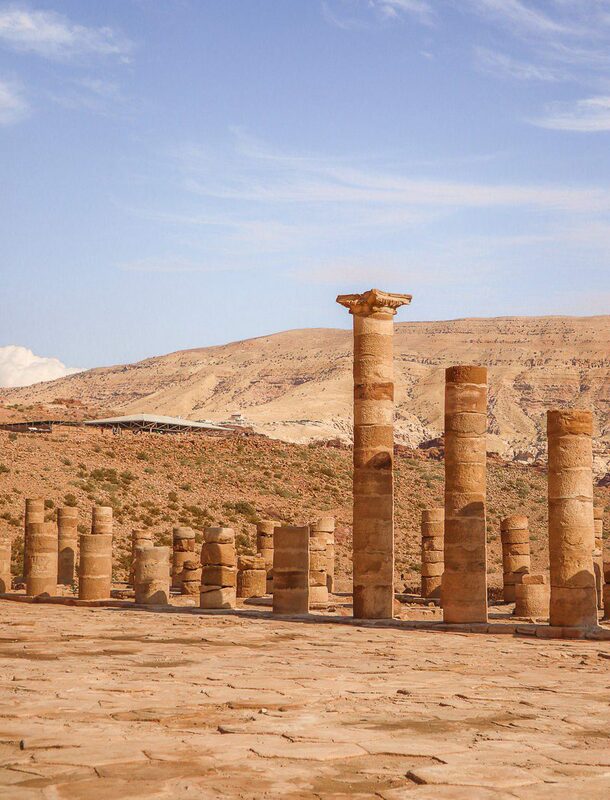 It was erected around 25BC – 100 AD. 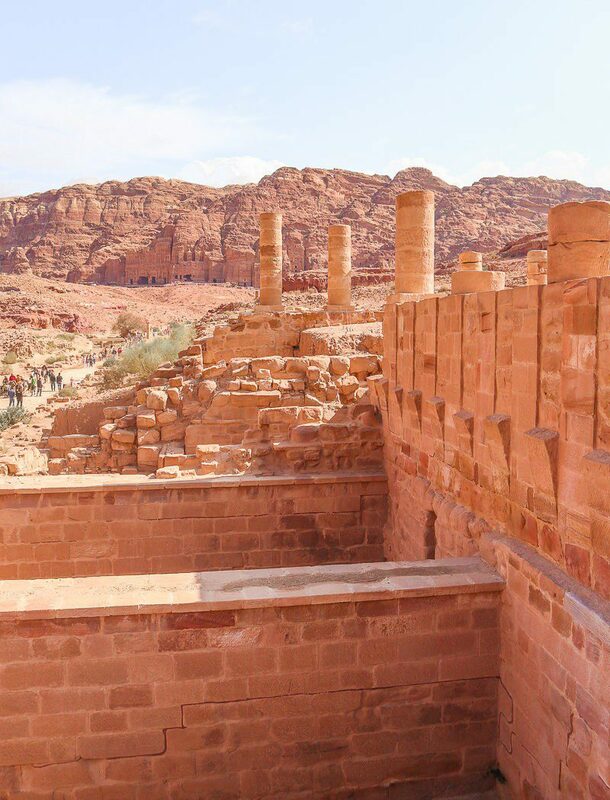 Although it is called ‘a temple’ there is a possibility that actually it served as a public building. 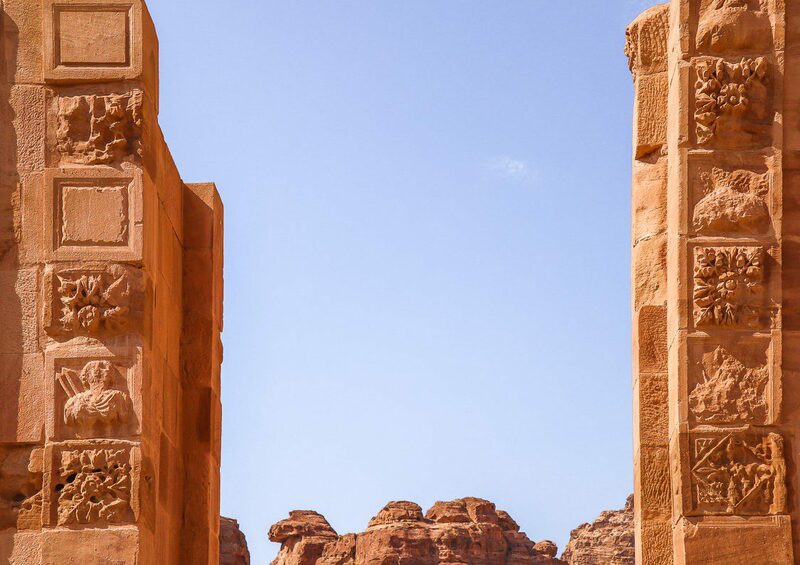 Erected in the 2-3 centuries AD, these Roman Temenos gate replaced the original Nabatean ones. Three aches of the gate were destroyed by the earthquake. 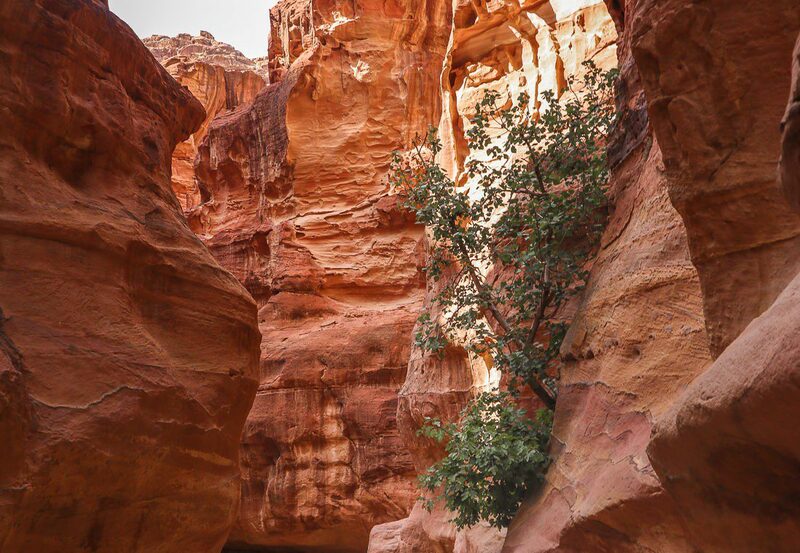 Don’t miss the Nymphaeum, the basin with water and ancient Pistachio tree by its side! 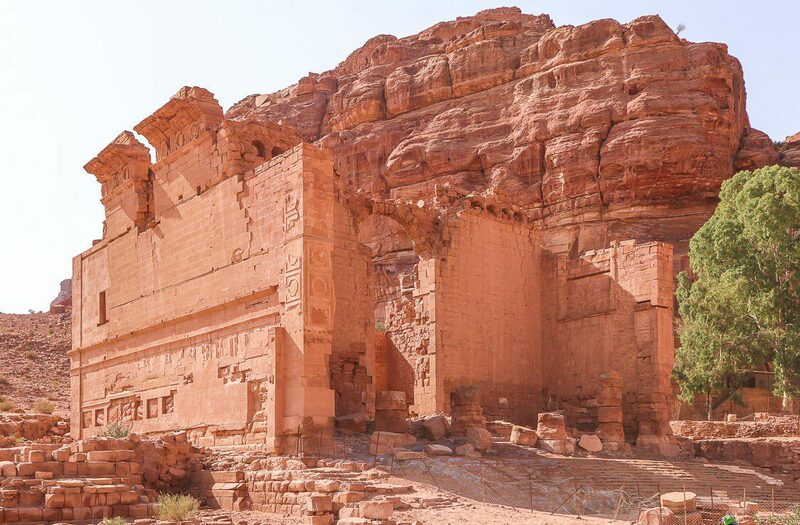 Qasr al-Bint, built in the first century AD was likely one the most important temples for Nabataean gods many centuries ago. 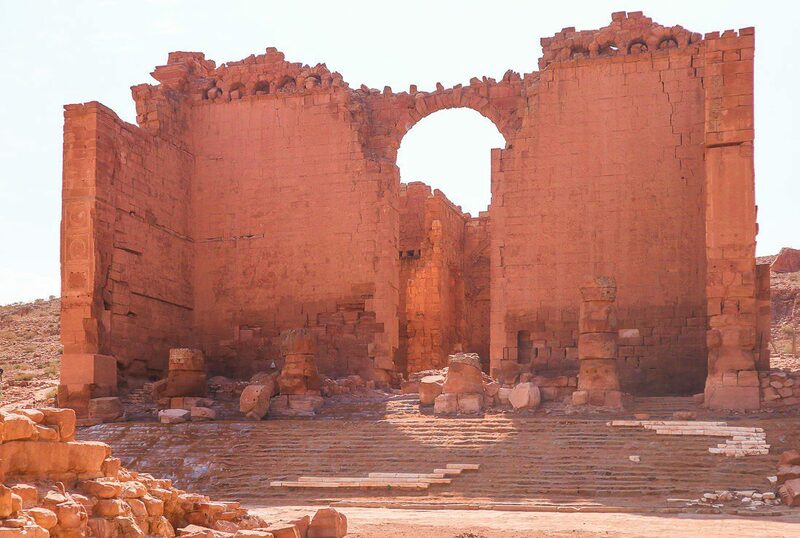 Its walls are still as high as 23 meters although the interior in not really well preserved. 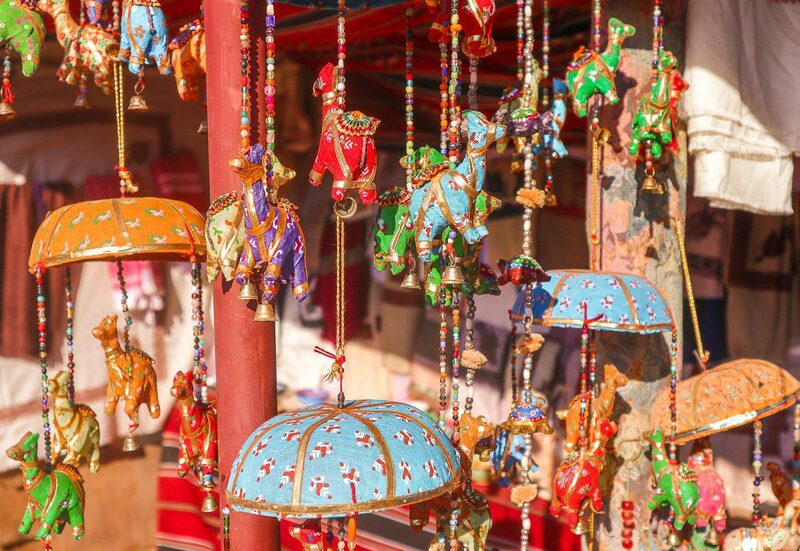 Meanwhile, the stucco decorations are still amazing! 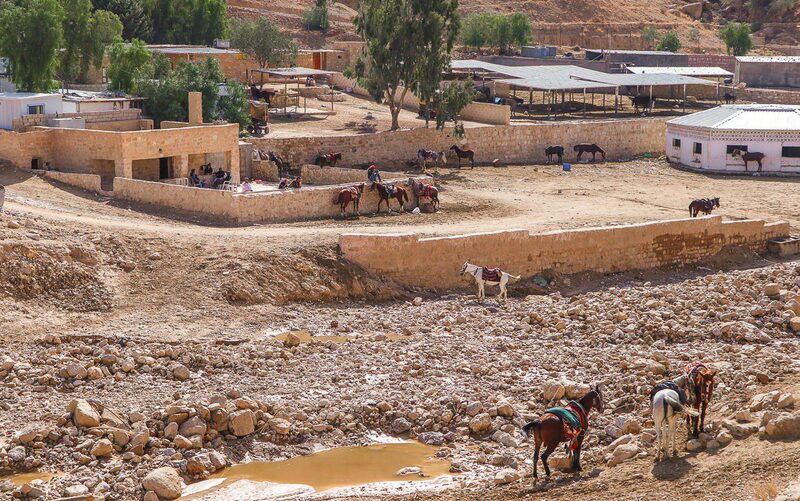 The hill near Qasr Al Bint is called Al Habis (the Prison) – the views from it are told to be really impressive. 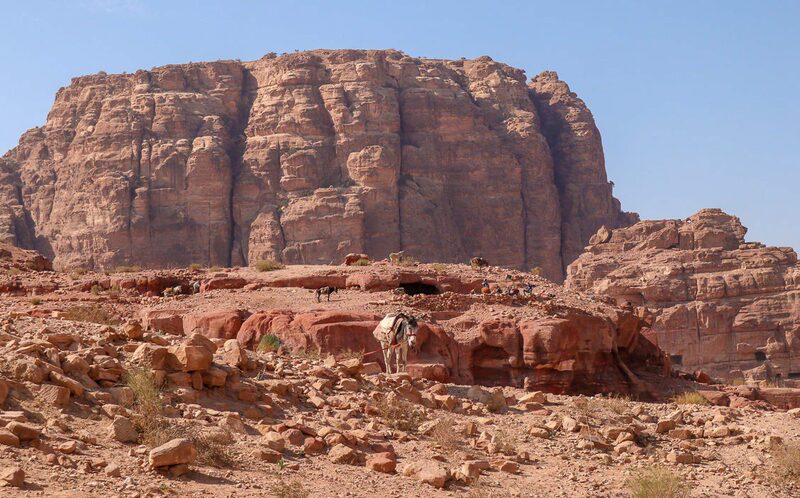 Besides it there are the ruins of almost totally destroyed Crusader fort of the 12th century AD. 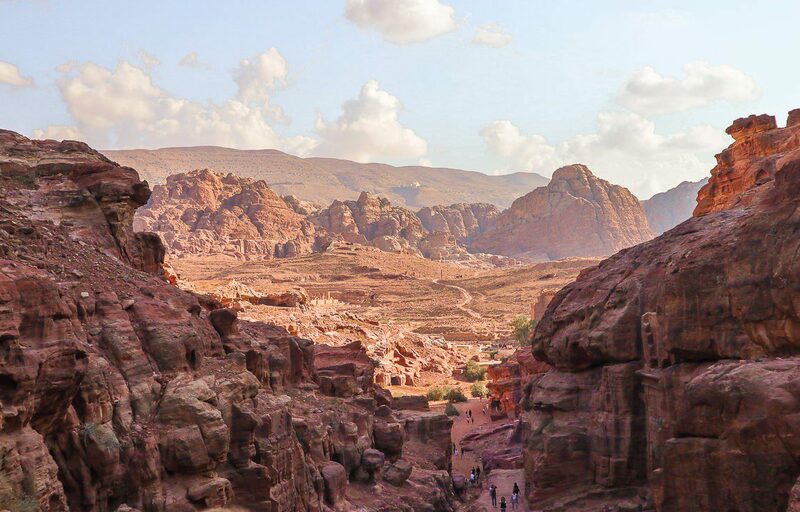 Interesting: you have very likely heard of T. E. Lawrence, Lawrence of Arabia – actually the battle he led took place exactly in the area of Petra. 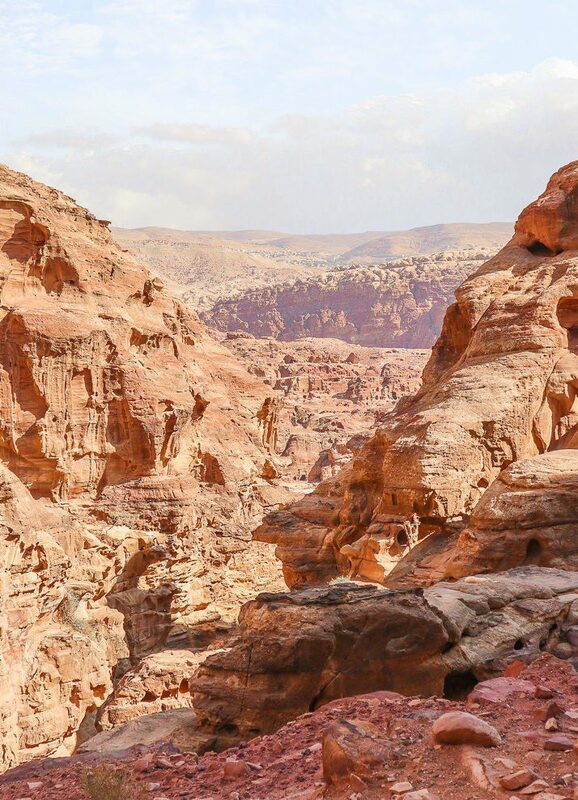 High Place of Sacrifice is the another hiking trail. 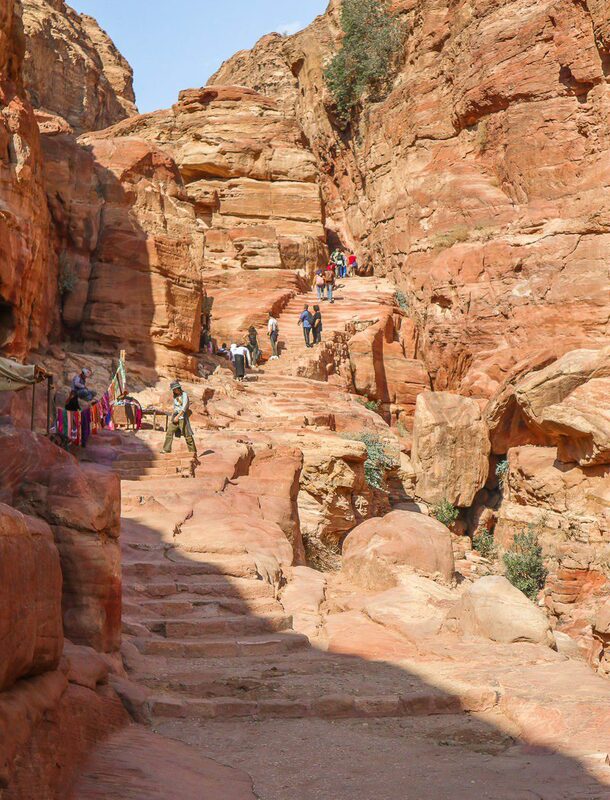 According to the official Petra guide, it’s a hard trail similar in difficulty to hiking up to the Monastery – but even longer. 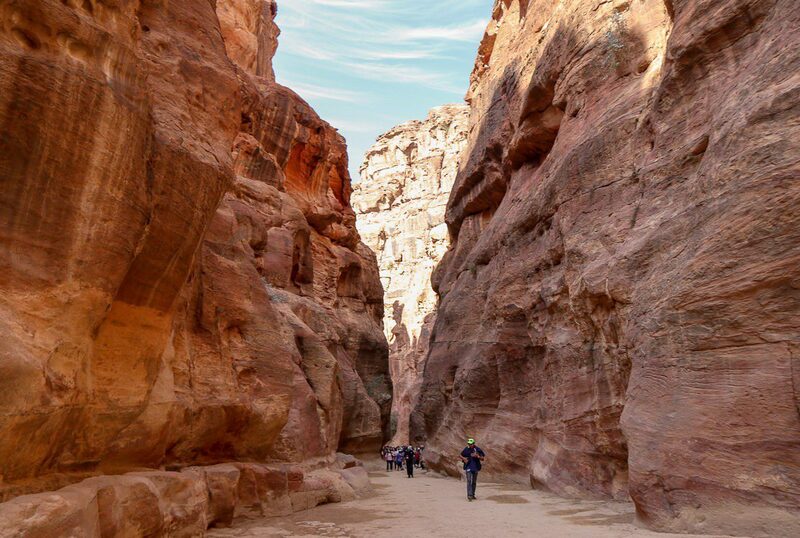 Unfortunately, there is almost no chance that you can do a whole trail while visiting Petra for 1 day. Monastery lays in the end of your route before you’re turning back to the entrance. 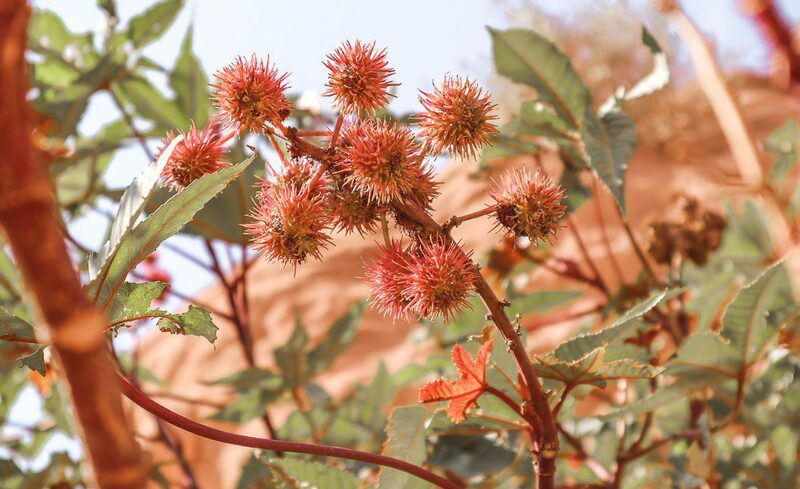 I have to warn you from the very beginning – climbing up there is really challenging (especially in a hot weather I suppose!) 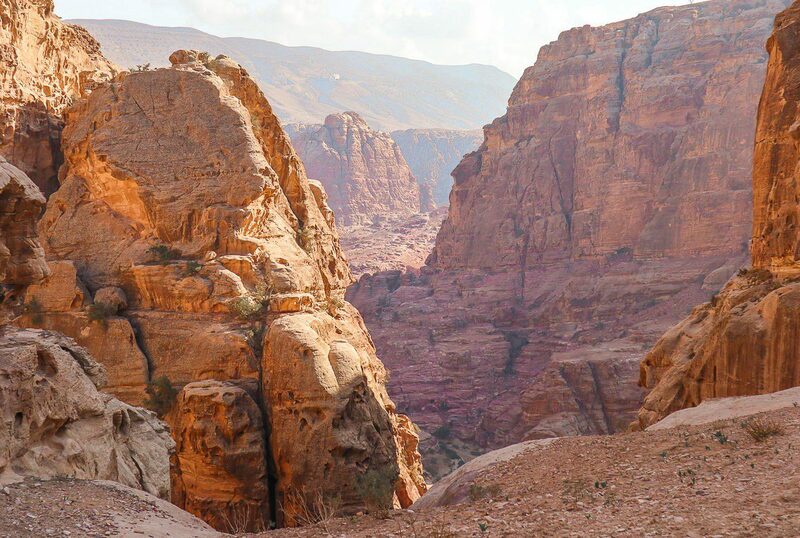 because of the 822 uphill steps that divide you and the Monastery. There are even more flat steps and slippery spots that were not counted. 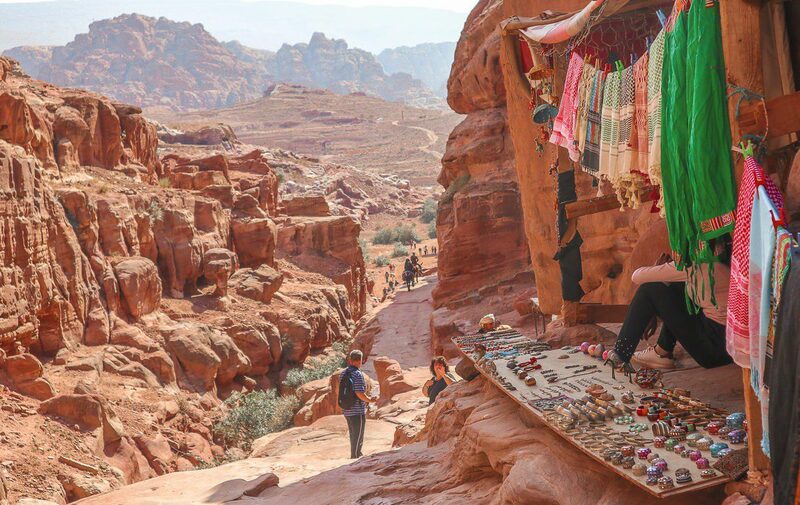 Beduins are selling their local (or maybe not, who knows) goods in tents all along the path as pretty much everywhere in Petra, so don’t worry about the water supply – you can buy a bottle anytime you need it. 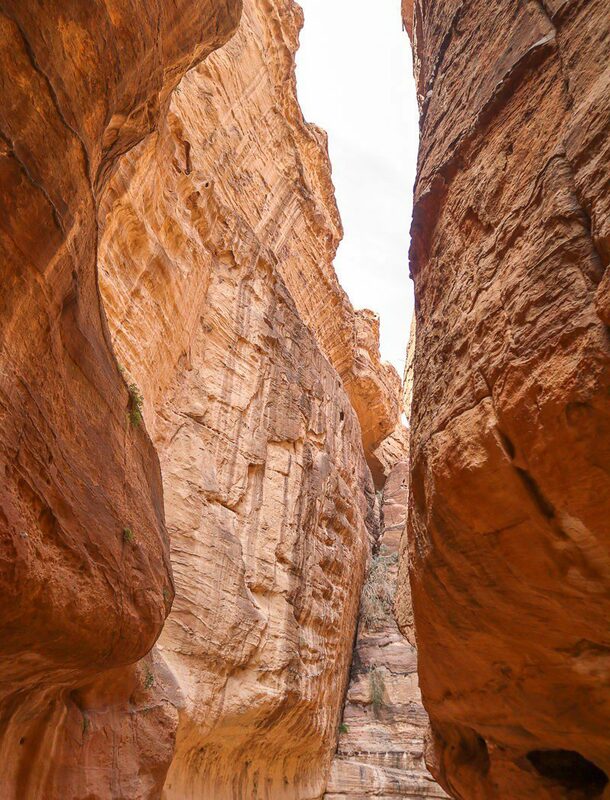 There are cafes at the end of the trail as well. If you choose to walk as we did beware of the donkey riders mentioned above. 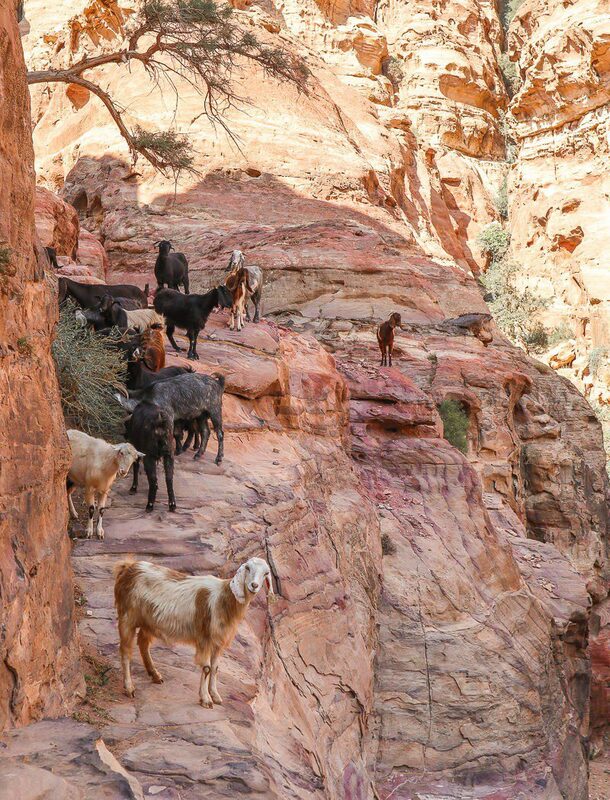 Some parts of the path are really narrow, and the animals might just ignore you coming and smash you into the wall. 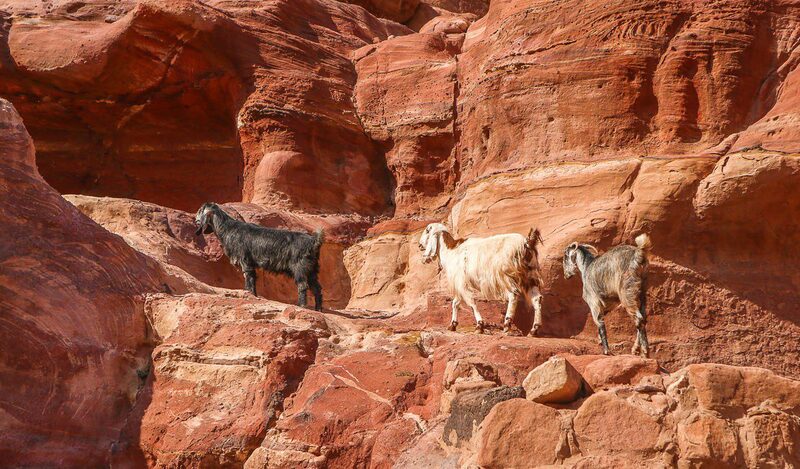 Stay alert for other animals around – cats, dogs and goats! These are important to spot just because of their cuteness, not out of caution. 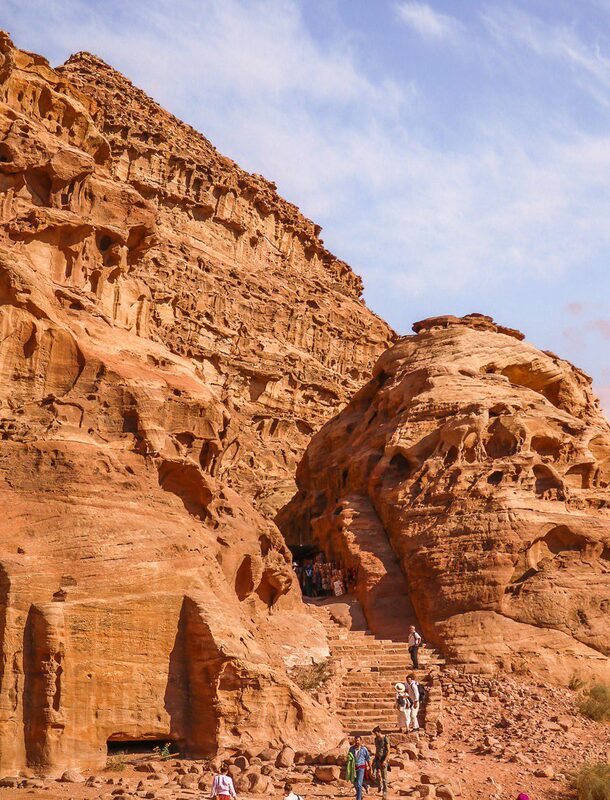 Tip: Don’t miss the Lion Tomb in an appendix at the beginning of the hiking trail – these two lions are such cuties aren’t they? 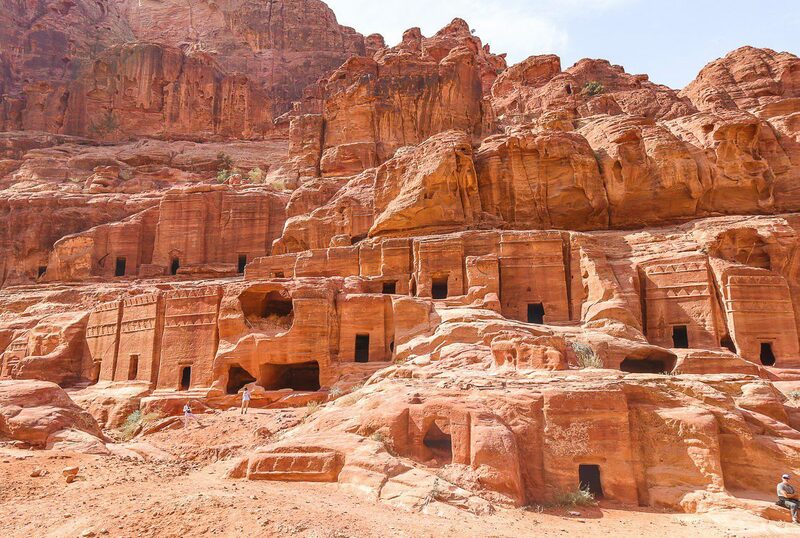 Although it might not be known as widely known as the Treasury, actually the Monastery is more impressive, bigger in size and better preserved. 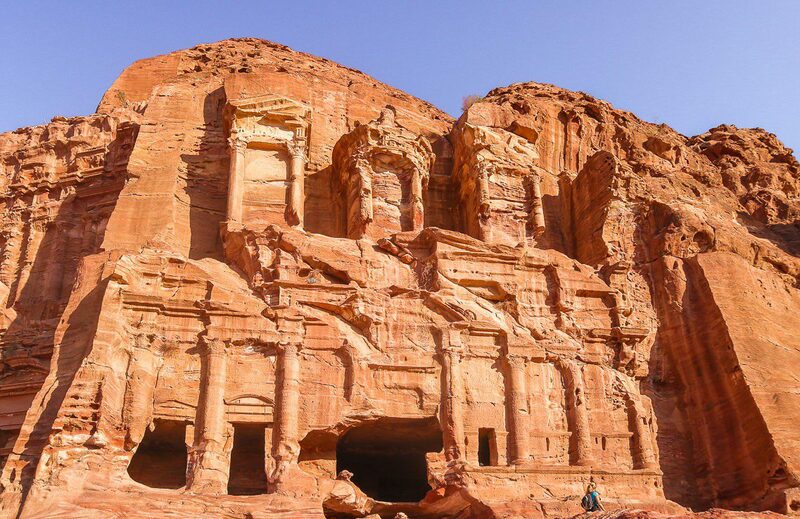 It was built in 3rd century BCE as a tomb but where the title comes from then? 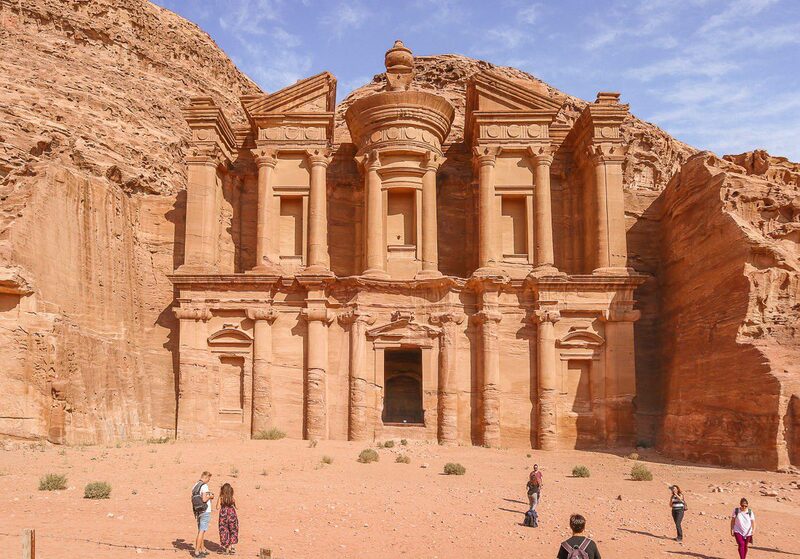 The archaeological discoveries suggested that it was used as a Byzantine church. 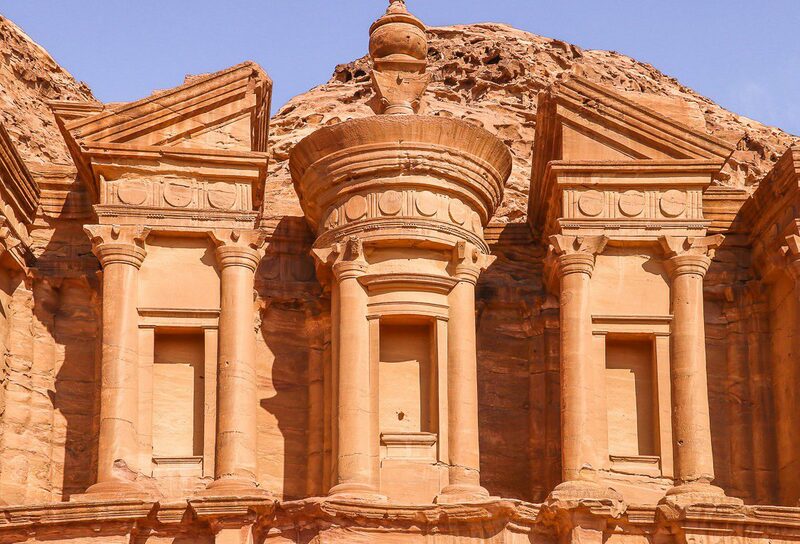 Interesting: did you know that Petra has a little ‘sister’ called Al Beidha, or Little Petra? 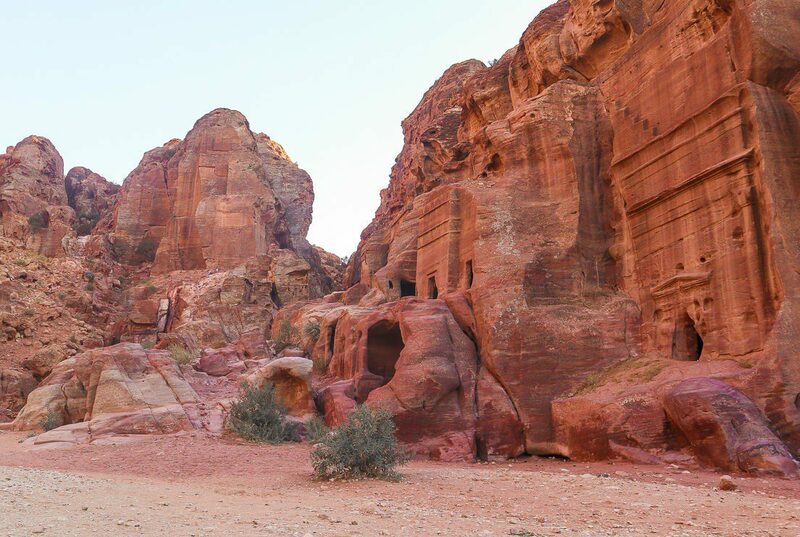 It also contains some ancient ruins and tombs and lies about 6 km from the Monastery. 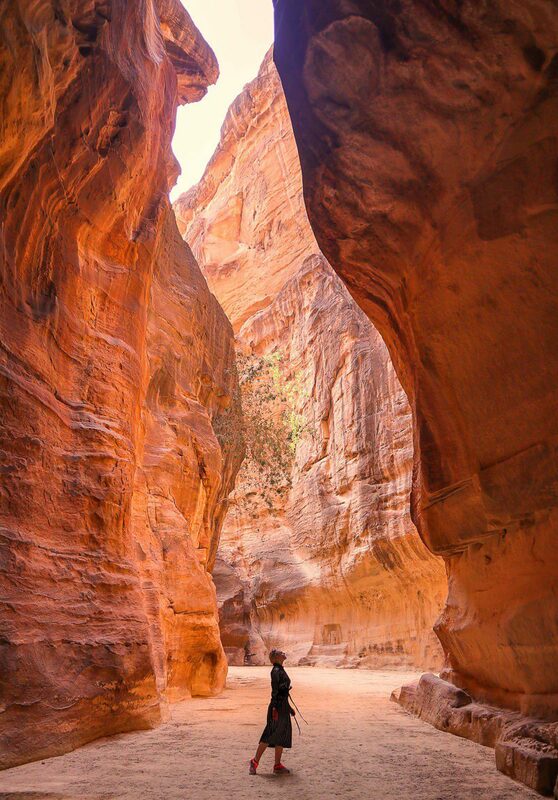 Spring and Autumn are usually considered the best seasons to visit Jordan because of the weather conditions. 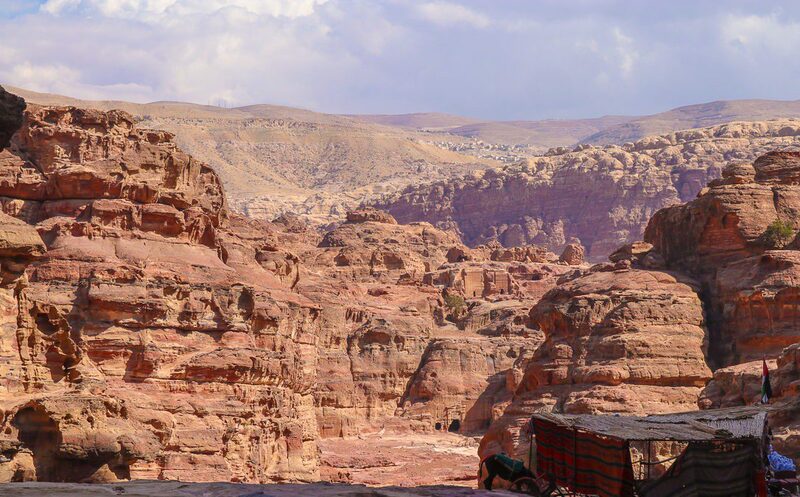 Actually we were visiting in November – and just a single day before our arrival to Jordan the whole Petra was evacuated because of the floods, the heaviest in many years! 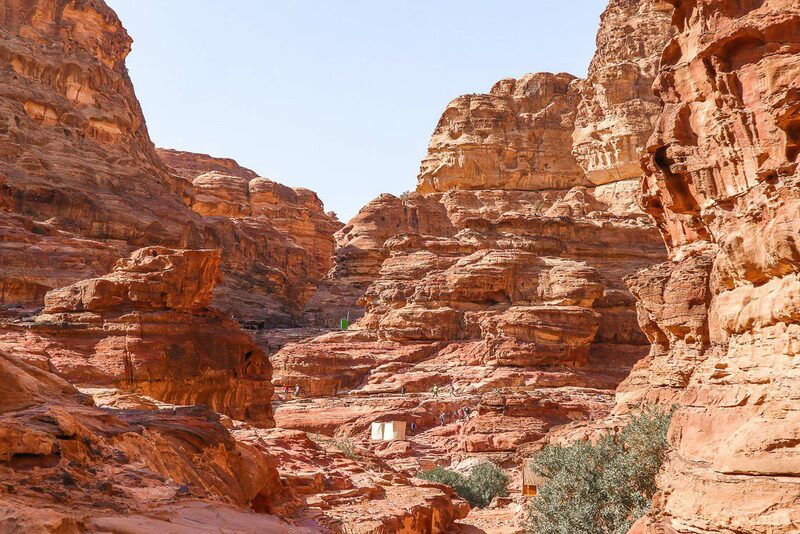 Waters rose up to 4 meters in some parts of the area and Petra remained closed – but we were lucky to be among the first tourists who came there after the reopening. 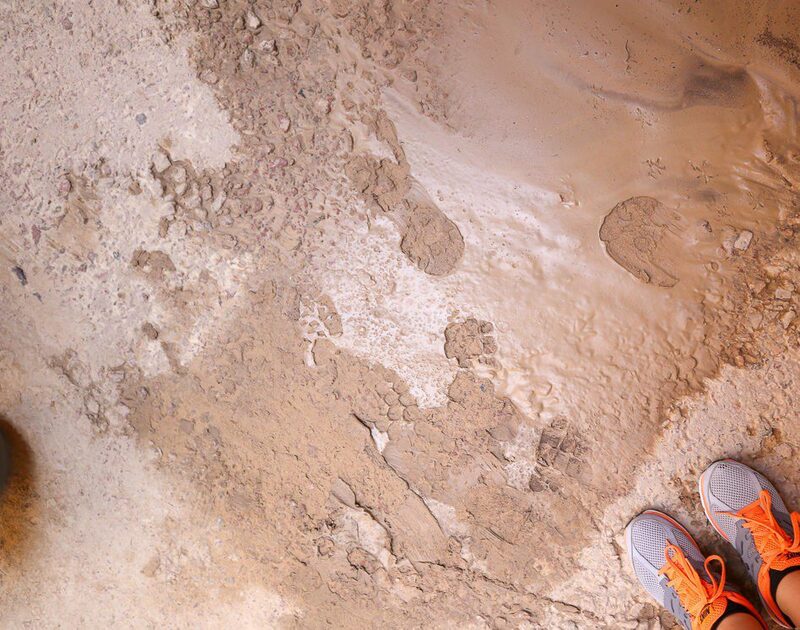 As you can see, the ground was a bit wet. 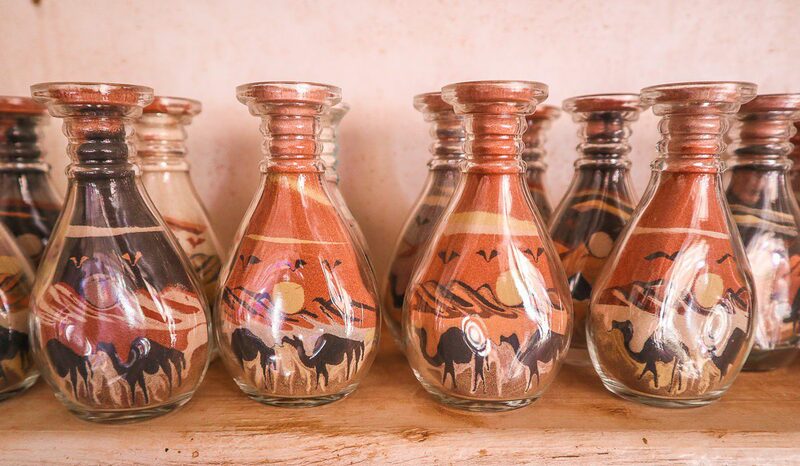 I hope you’ve enjoyed my today’s blog!